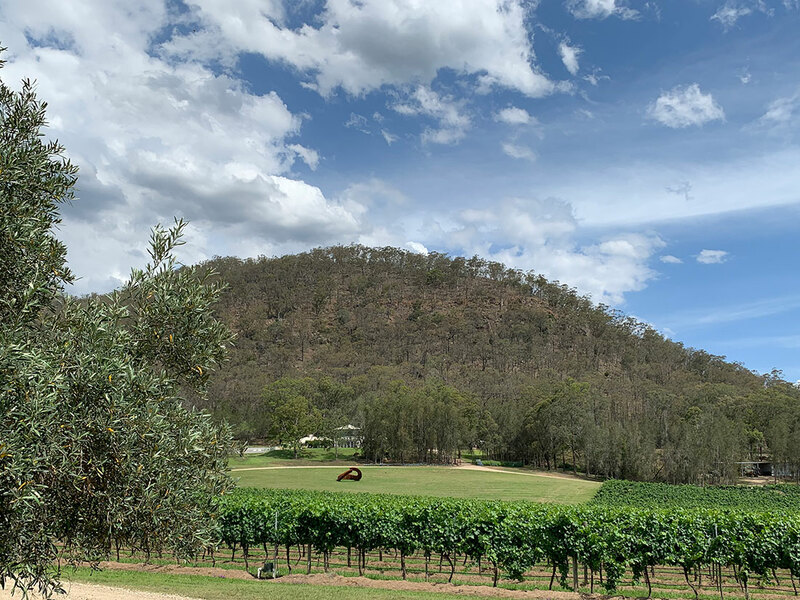 The history of the Winmark Wines is richly layered in stories and entwined with personal connections. 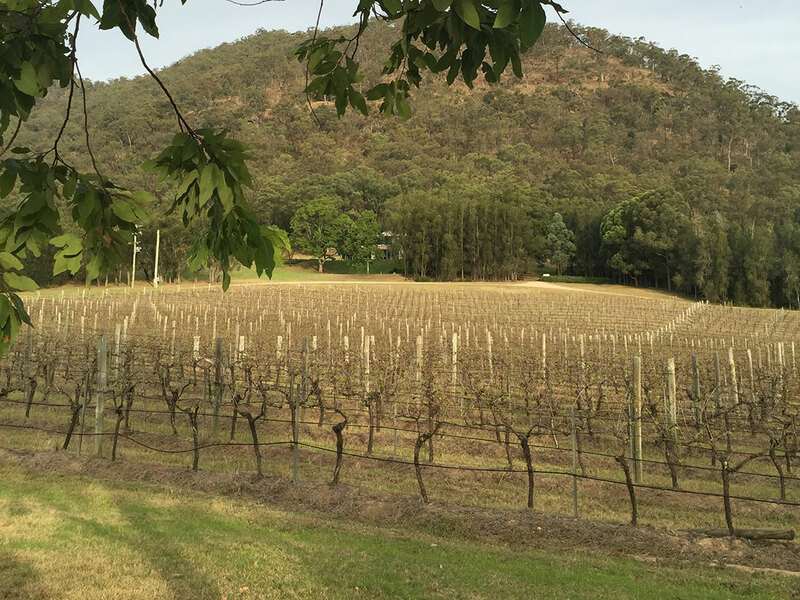 The vineyard was established in 1988 by the late founder of Macquarie Bank, David Clarke. 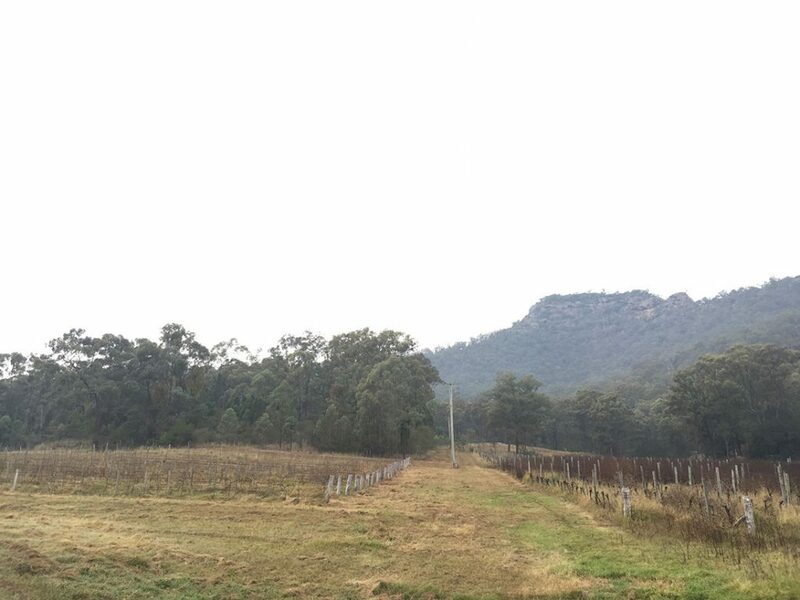 David named the vineyard after the iconic large rock on the property, Pooles Rock. Local rogue and former convict Richard Poole was known to sleep in the hollow of the rock he eventually bequeathed his name to. Pooles Rock vineyard quickly became famous for its award-winning chardonnays until it was sold in 2011. 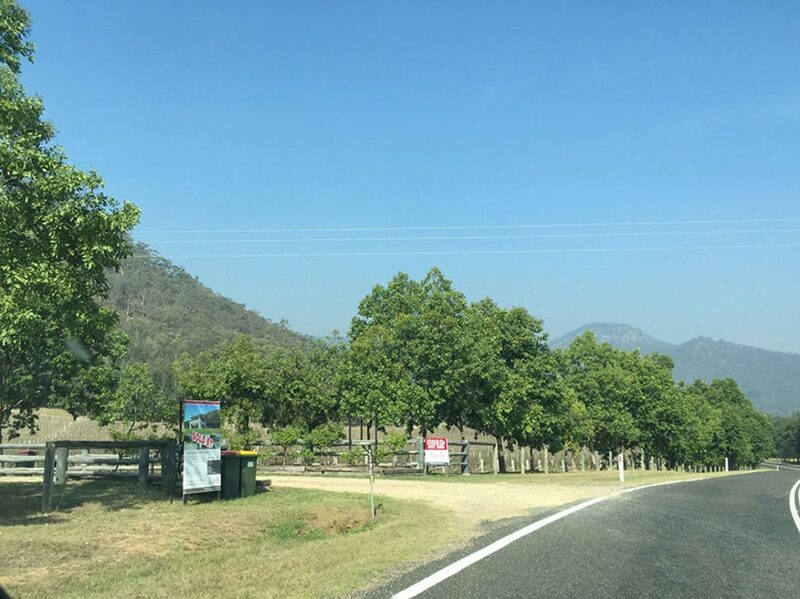 The vines languished, neglected, for the next five years until Karin Adcock and John Winstanley rediscovered the property and purchased it in 2016. 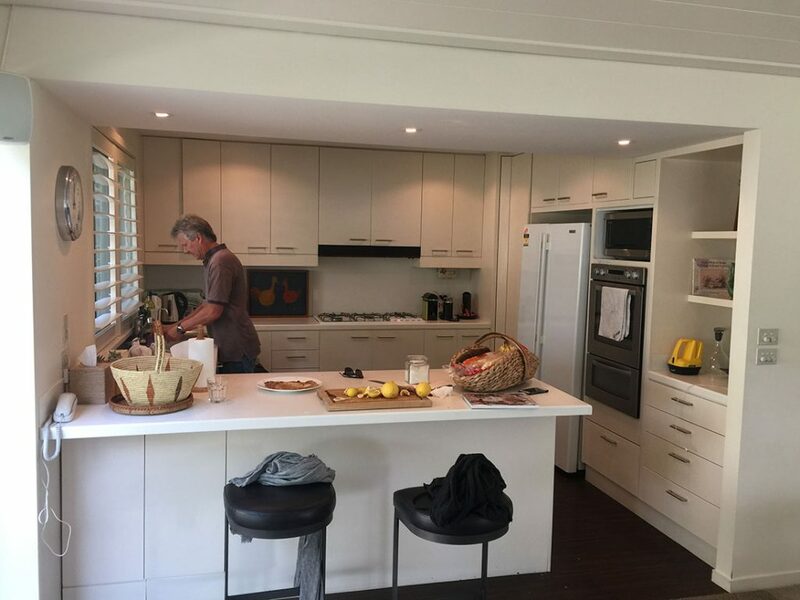 The couple had rented a house on the Mornington Peninsula the previous Christmas to host their large family. 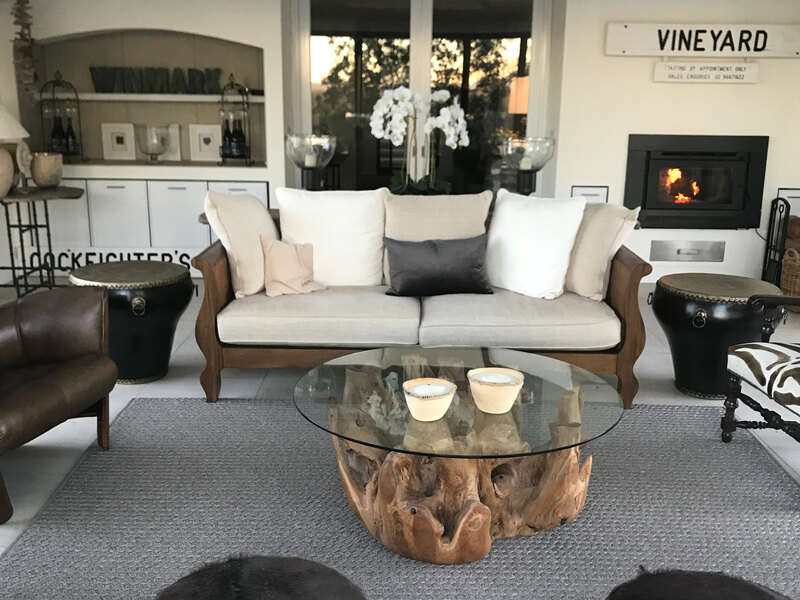 Their primary motive in buying Pooles Rock was to recreate the tone of this successful holiday and nurture an environment where family and friends could comfortably connect. 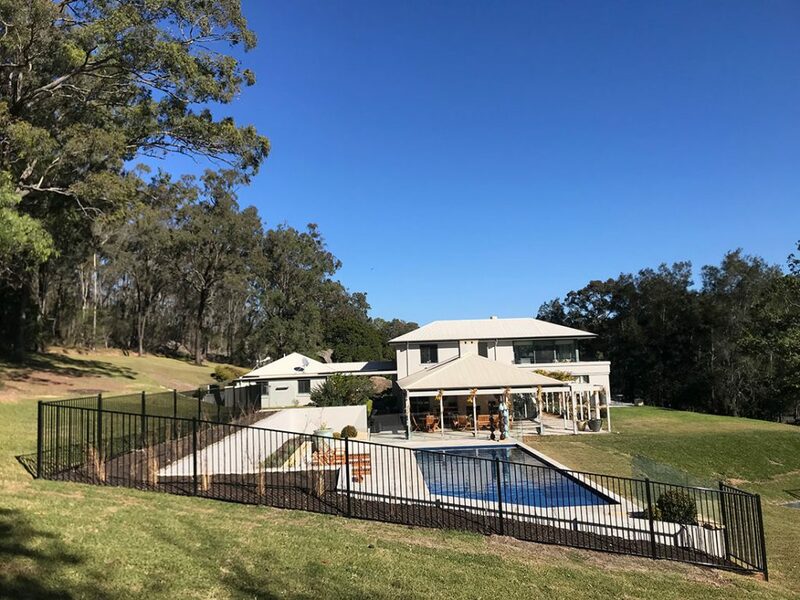 The pair’s combined backgrounds as executives and entrepreneurs and their varied experience in the wine industry and in managing large properties quickly saw them restore the vineyards and the luxury and cottage homes. 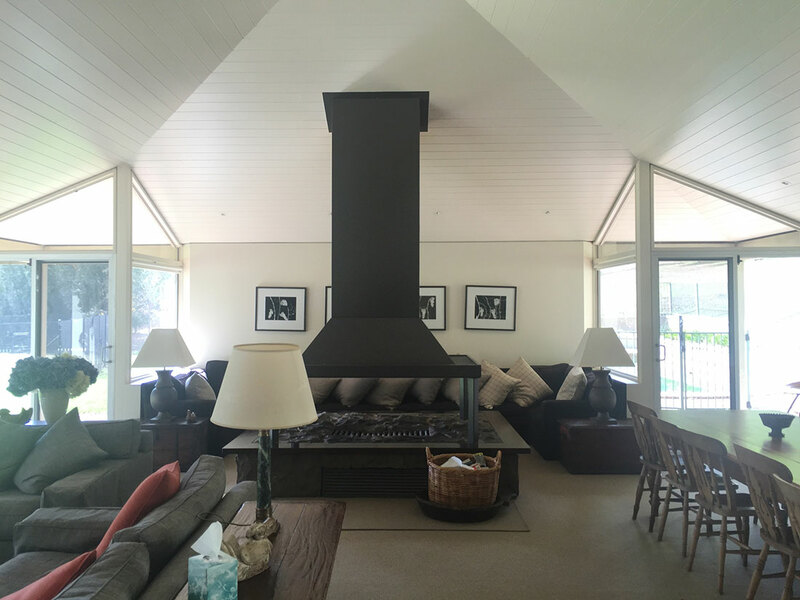 Karin’s love of trees and interiors gave the property its personality. 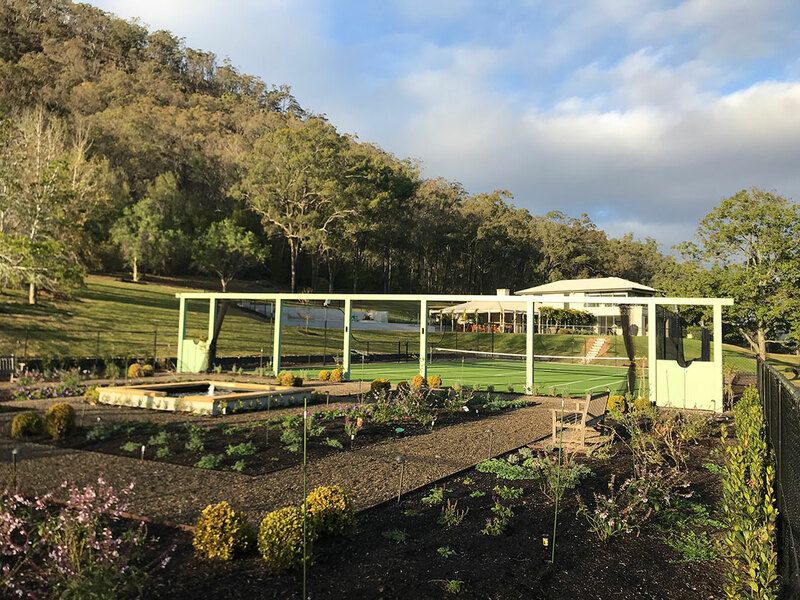 She commissioned one of Australia’s most outstanding landscape architects, Paul Bangay OAM, to create and link the perennial and rose garden and gazebo, the 12.5m pool and tennis court. 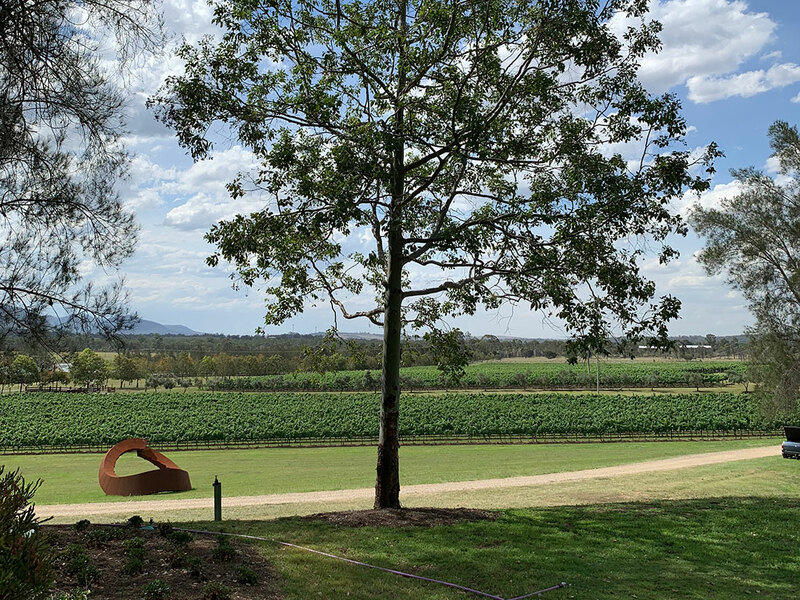 She also commissioned relatively unknown sculptor David Ball, just before he won the 2017 Bondi Sculpture by the Sea major prize, to build Biosis, a massive steel structure that is perched above the vines. The pair employed two talented individuals with strong links to the area, viticulturist Liz Riley and vineyard manager Dave Grossner. 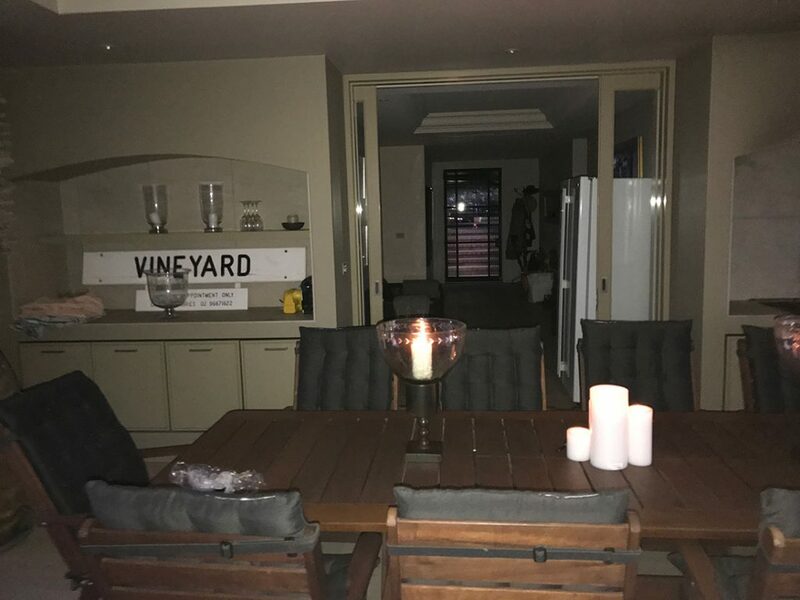 Karin and John created a series of Winmark landmarks, including the fire pit entertaining area and Karin’s Koppie, a formal stand of 40 deciduous trees overlooked by the ancient Yellow Rock escarpment. 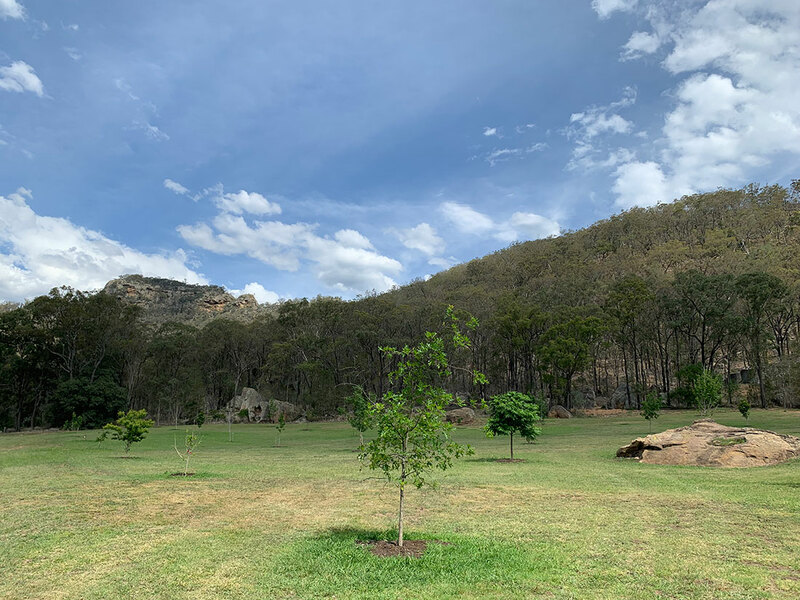 The rebuilding of the cellar door, designed by Karin’s sister, award-winning international architect Fong Chan Zeuthen, is due for completion in 2019. The Pooles Rock name was not sold with the property so Karin and John settled on “Winmark Wines”. The name works on two levels. Firstly, it combines John’s surname, Winstanley, with Karin’s maiden name, Enemark. Secondly, “Winmark” – in Karin’s native Danish – means “field of wines”. 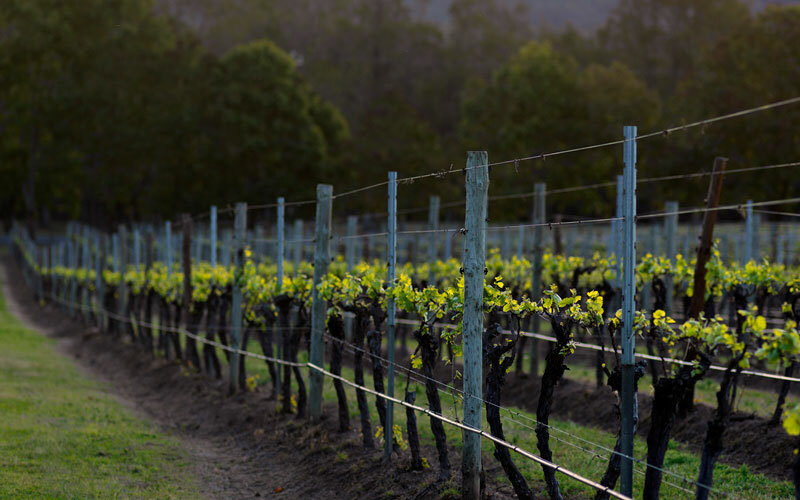 The 28 acres of vines have been carefully nurtured back to full health after a five-year period of neglect. 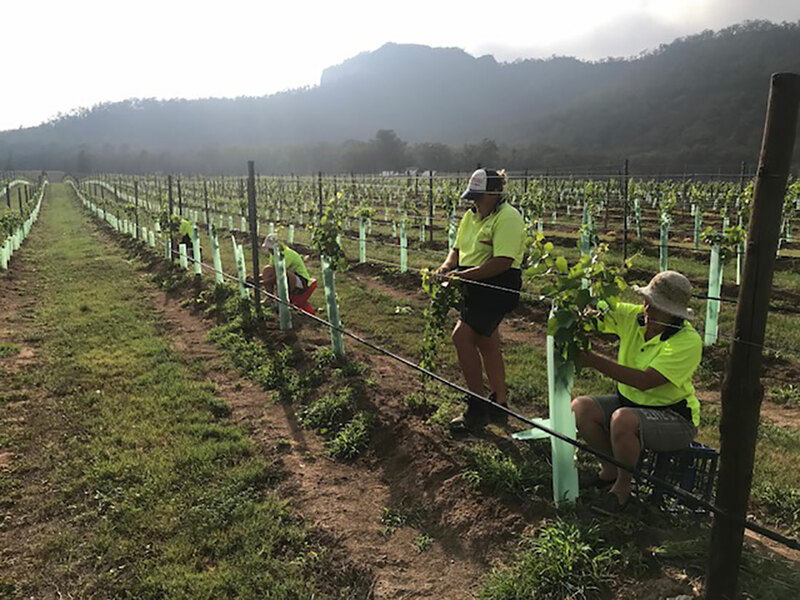 Two talented professionals, 2017 Viticulturist of the Year Liz Riley, and Vineyard Manager Dave Grosser have made this their professional mission. 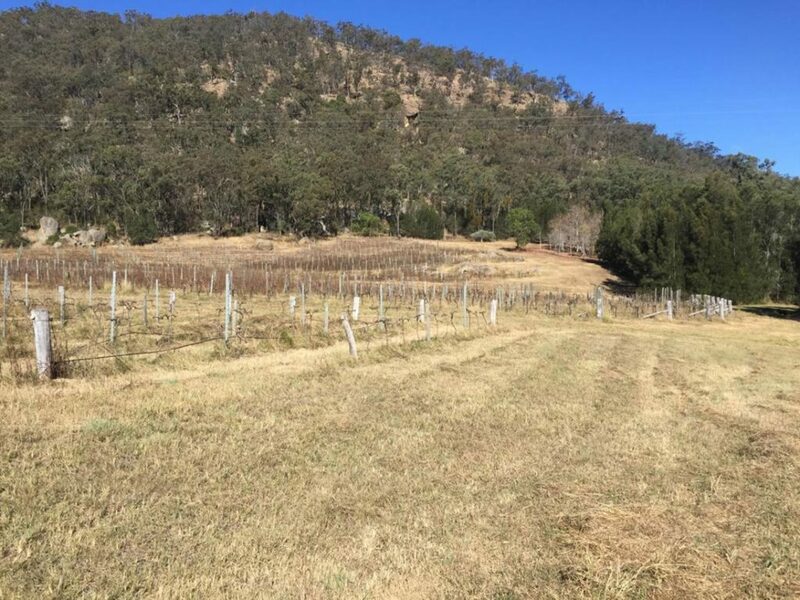 About 10 acres of verdelho in poor health was replaced by a new chardonnay clone from Burgundy in September 2017. Its first vintage is due in January 2019. Money and energy were not spared to refurbish, revitalise and – where necessary remove and replace other blocks. Roses now bookend each row in a nod to tradition. 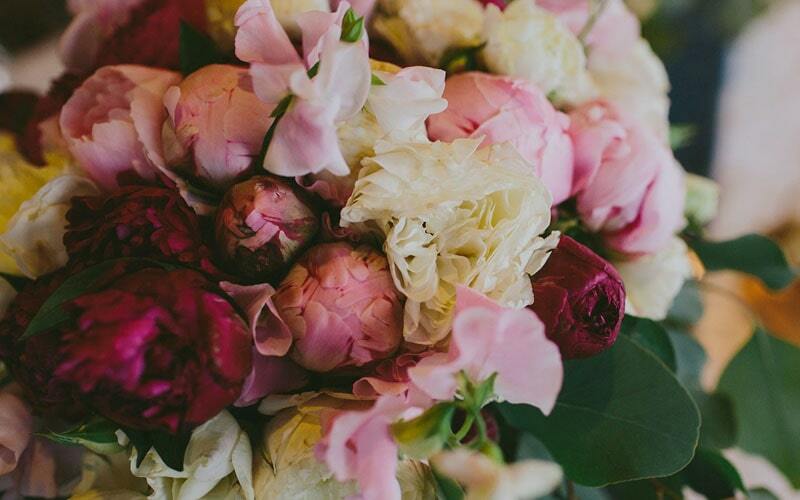 Roses were once known as “the canary of the coalmine” as they acted as an early-warning system for fungus. They also attracted insects such as aphids away from the vines and were said to encourage draft horses to turn properly because of their punishing thorns. Block 5 with the new chardonnay from Burgundy Nov 2017. Block 5 with verdelho grapes in very poor condition May 2016. Block 5 with new Burgundy Clone Chardonnay Nov 2017. This picture of ill health was taken in May 2016. Half of Block 1 was removed. This picture of good health was taken in November 2017. The cleared Block 1 incorporates grass and the stunning sculpture, Biosis, by award-winning sculptor David Ball. 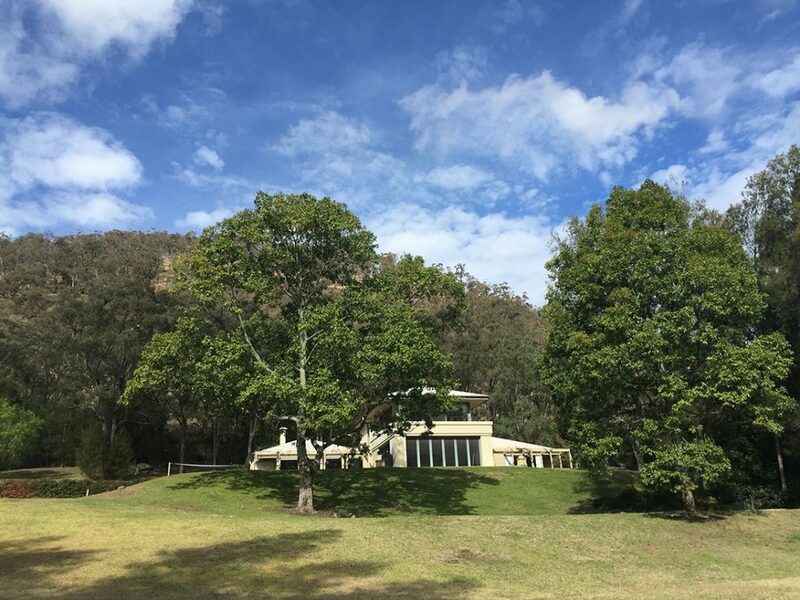 This private view of Blocks 1 & 2 from the main residence in 2016. 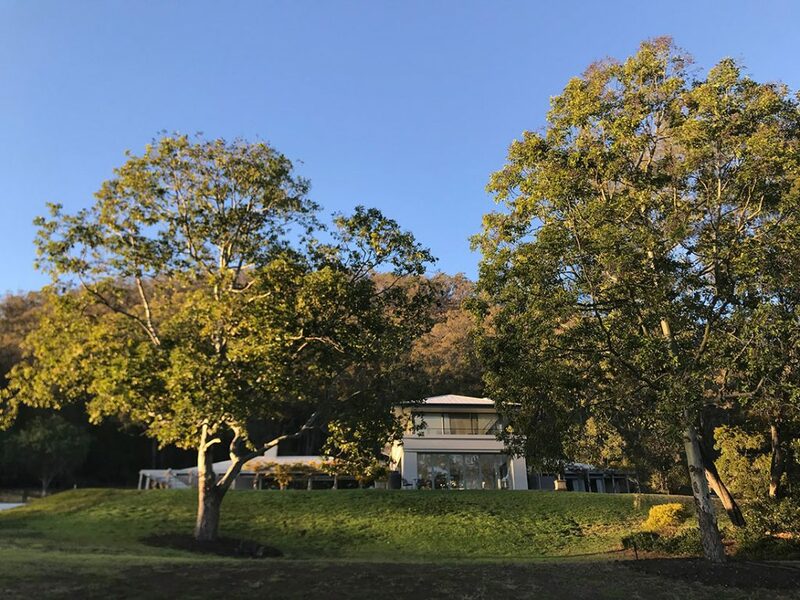 This private view of Blocks 1 and 2 from the main residence in 2018. 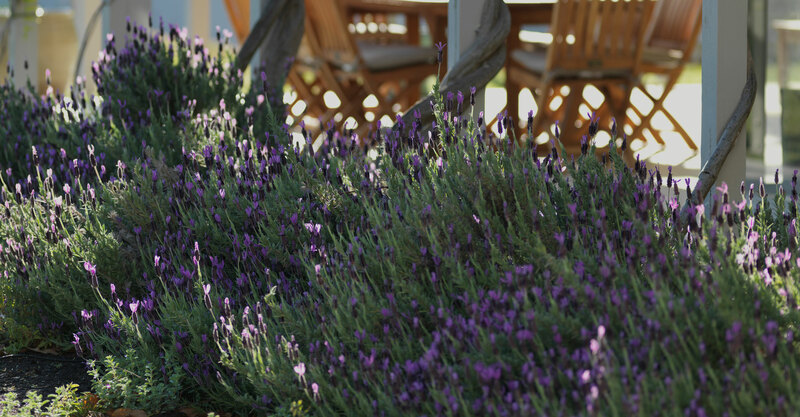 Renowned landscape architect Paul Bangay utilised westringia and lavender to redesign the front entrance. Owner John provided the finishing flourish when he gave two flagpoles to his partner and owner Karin for her birthday. The Danish and Australian flags welcome guests and celebrate the owners’ nationalities. 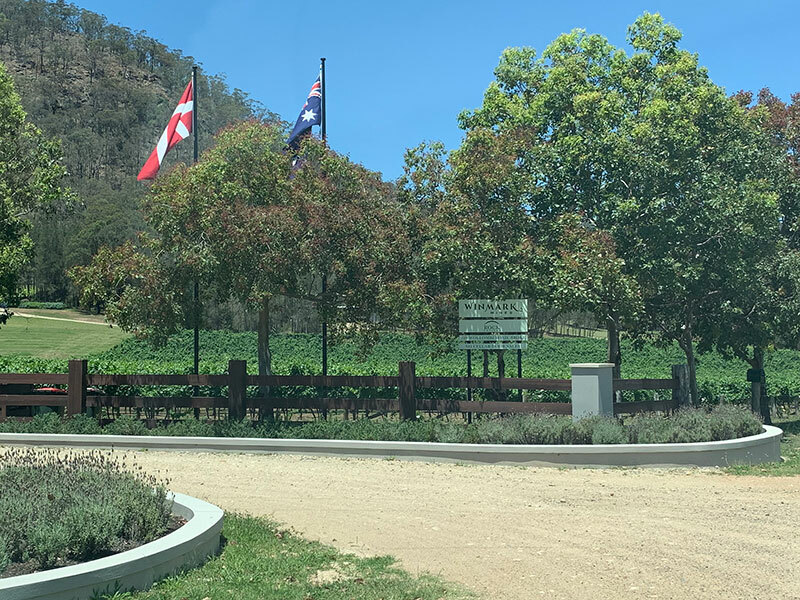 Front entrance to Winmark wines Nov 2018. 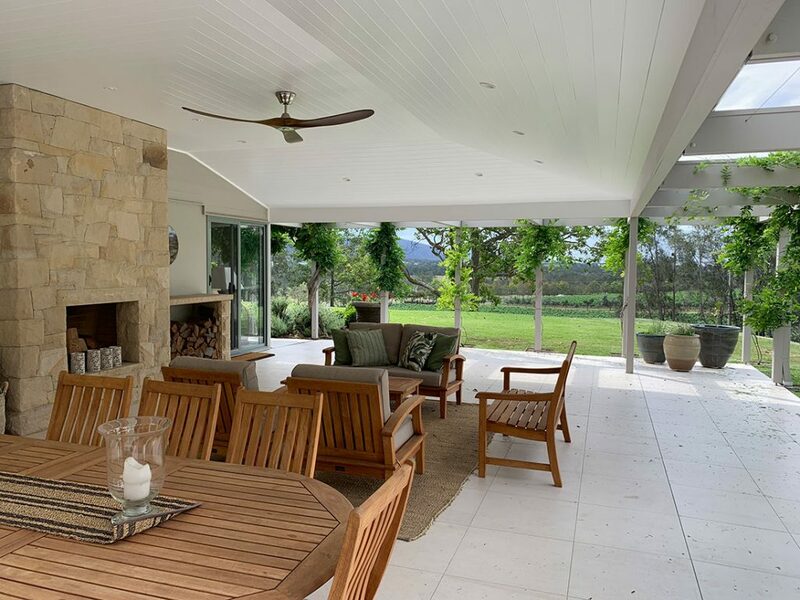 Winmark Private Home is a luxury two-storey home designed for an indulgent getaway or executive rental with access to a pool, tennis court, perennial and rose garden and overlooking the Vineyard and Biosis. Newly painted inside & out and a new large extended Alfresco area with a large outdoor sandstone fireplace Nov 2018. 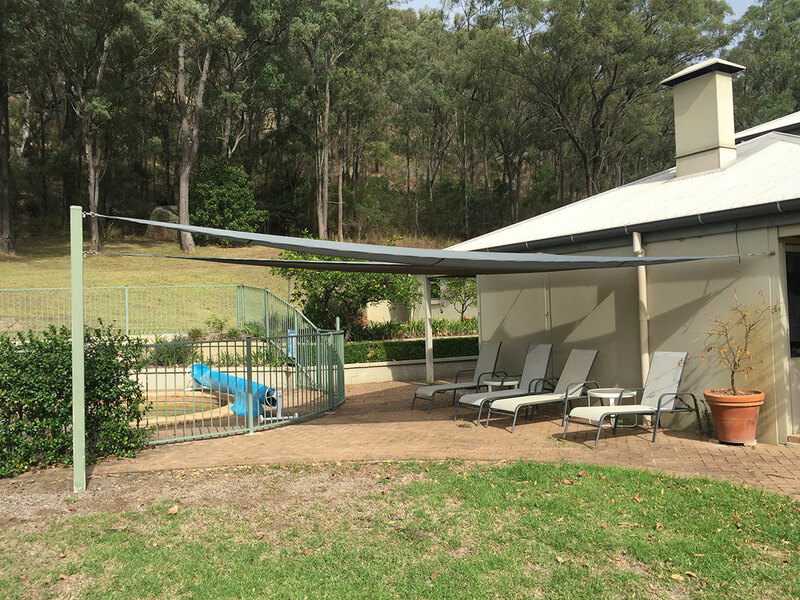 The old outdoor area with the original pool May 2016. The 12m dry-edged pool designed by Paul Bangay and new al fresco complete with stone fireplace provide splashes of luxury Nov 2018. 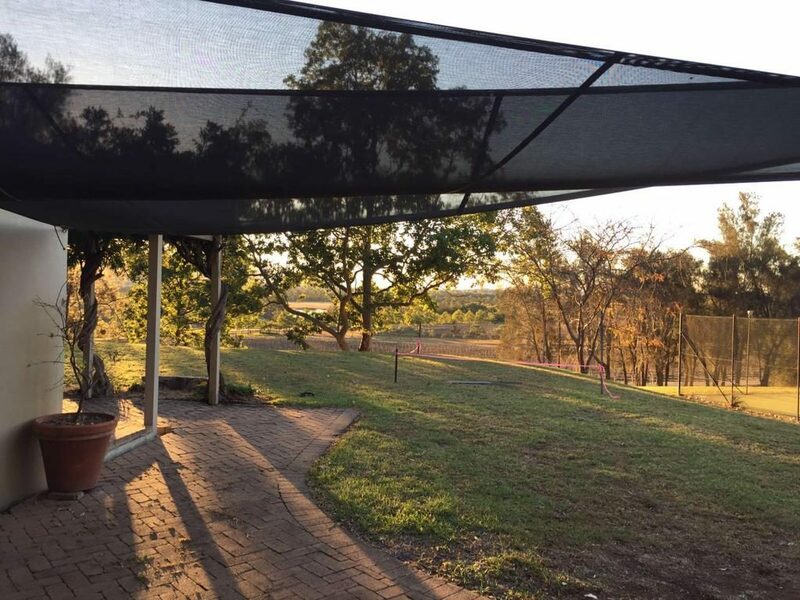 The old outdoor areas was covered with sagging shade cloths May 2016. 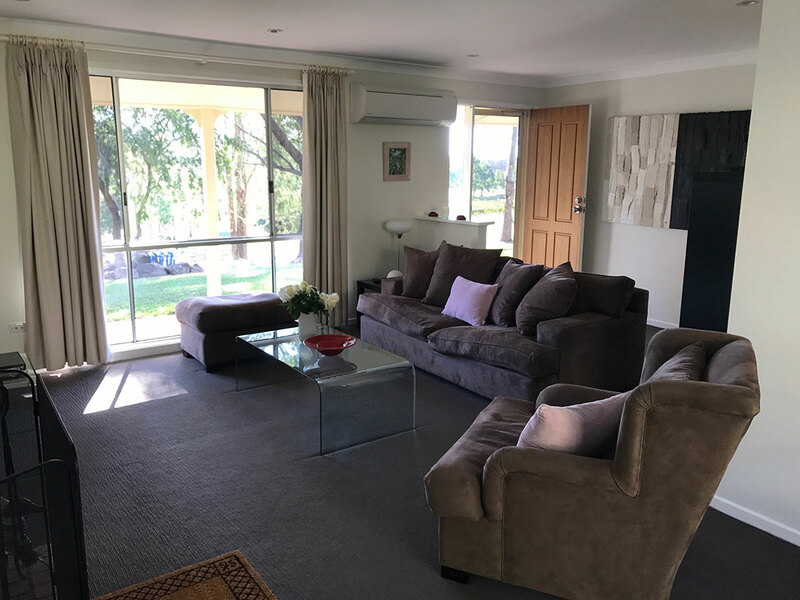 The al fresco area had a complete makeover Nov 2018. The original outdoor area May 2016. 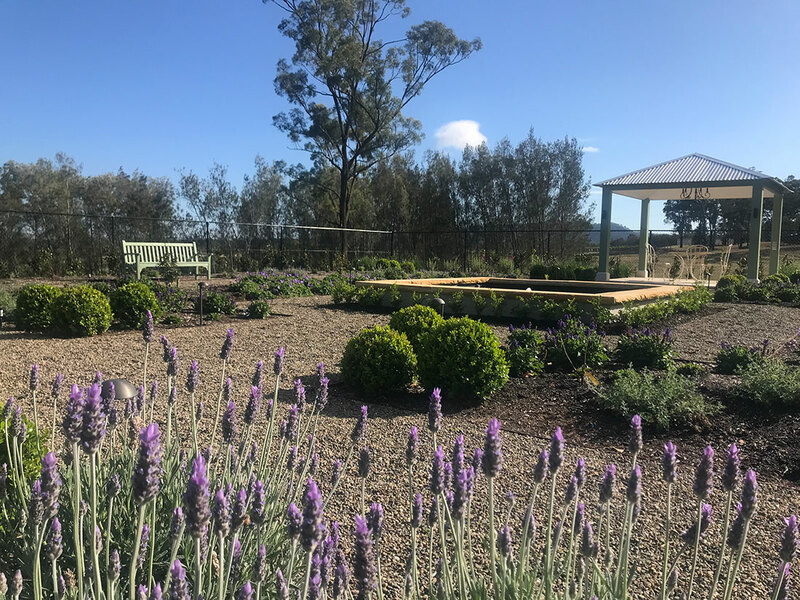 The new outdoor area extends from the house seamlessly and continues the wisteria theme Nov 2018. 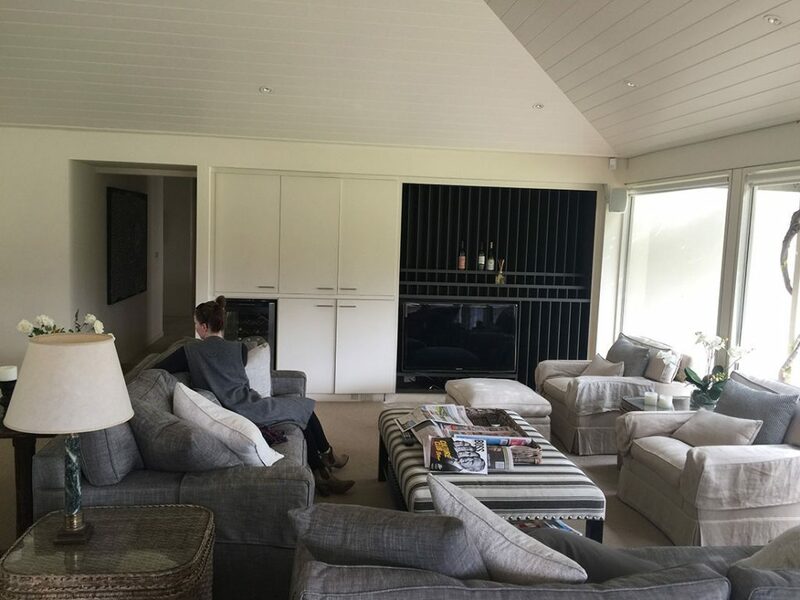 The original indoor fireplace was cosy but dominated the living room May 2016. 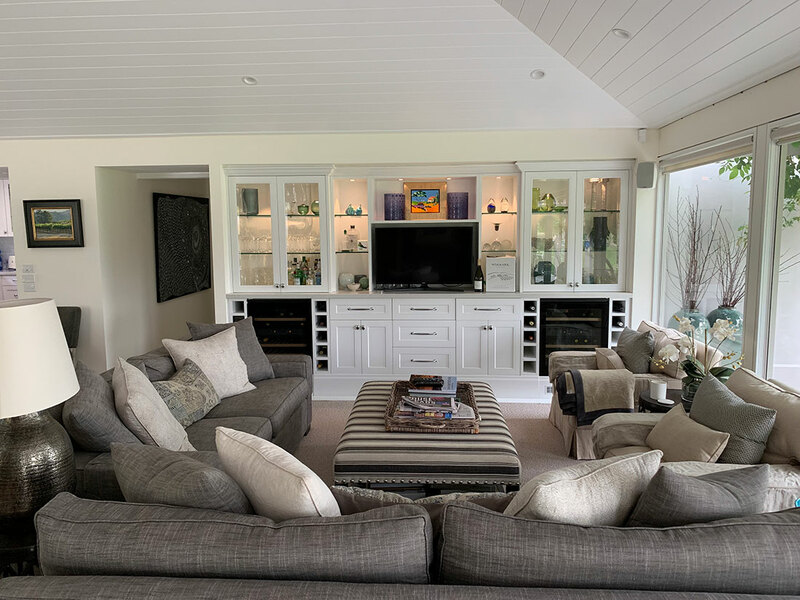 The living room was extended and a new fireplace was constructed by master stonemasons Jul 2018. 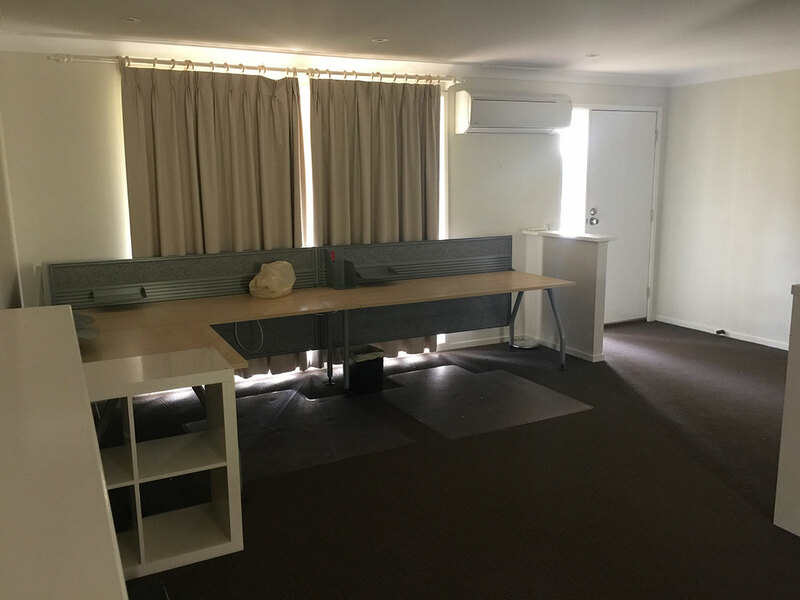 The original kitchen May 2016. 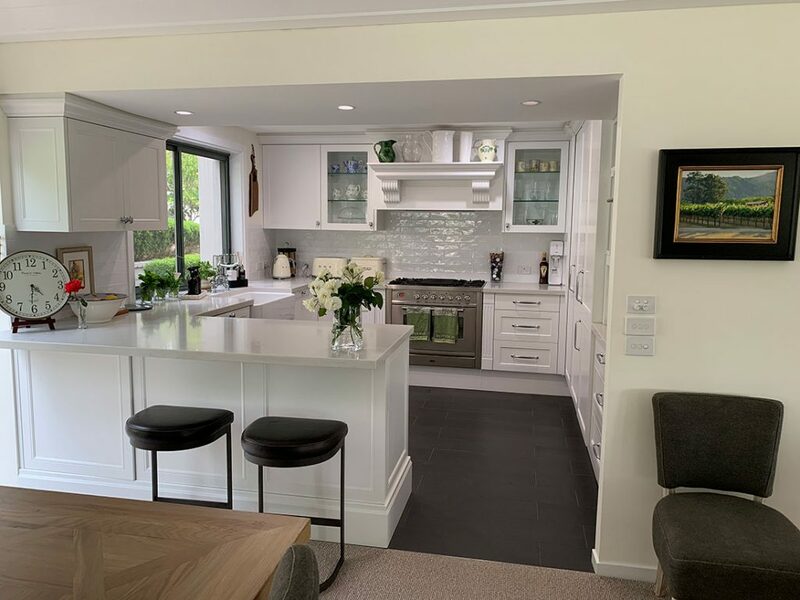 The new kitchen was extended slightly and very efficiently designed by De Gabrielle Kitchens Nov 2017. 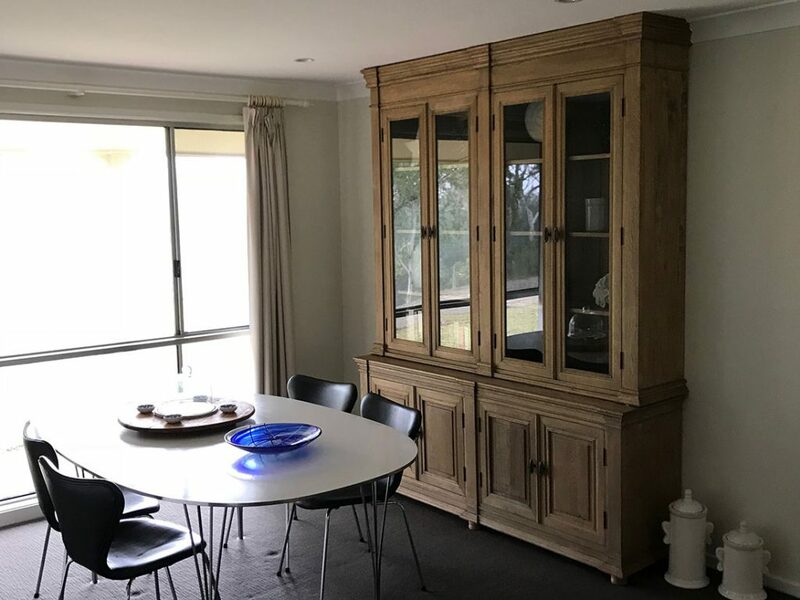 The old television and entertainment units were functional but not very decorative May 2016. The entertainment wall designed by De Gabrielle Kitchens extends the sleek lines of the kitchen, as seen in Nov 2017. The large outdoor room enclosed by screen doors only May 2016. 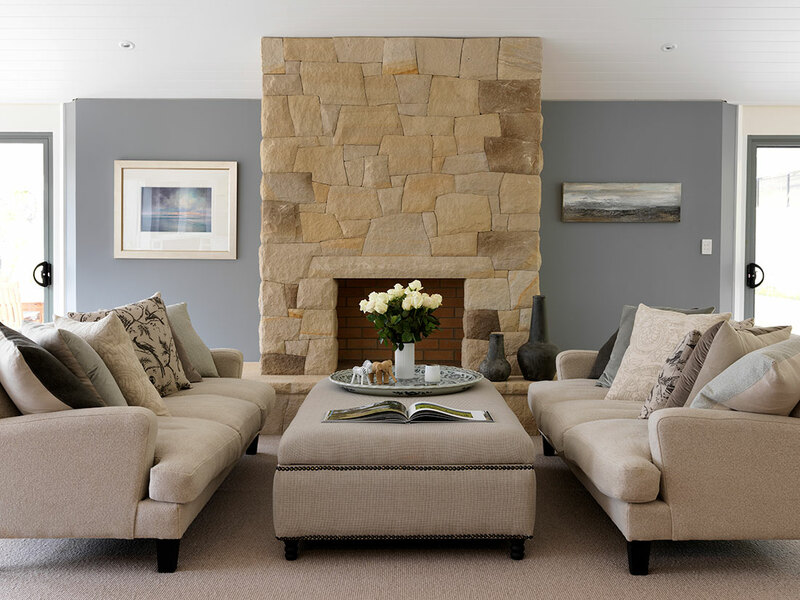 The popular Rock Cottage has been lovingly restored and is known for its private and cosy feel. 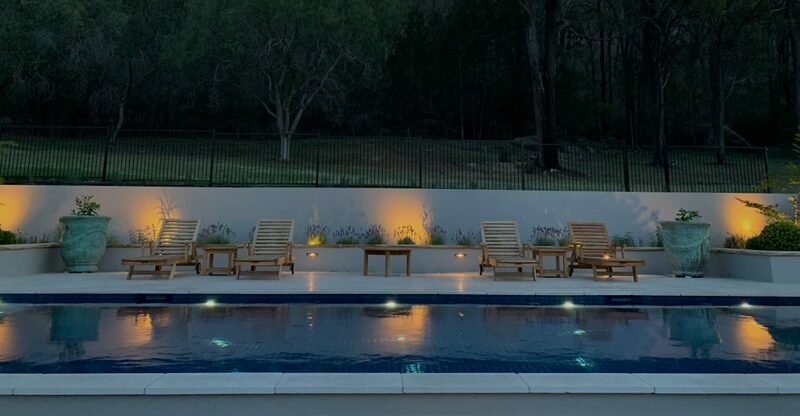 It is perfect for couples, families, and groups of friends. Cosy living room with fireplace. 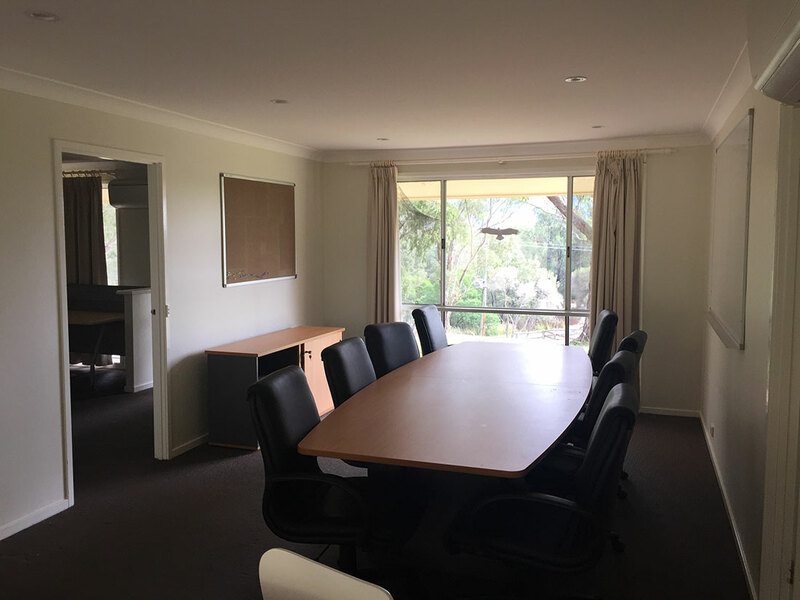 Adjoining kitchen & dining room with amble space up to 10 people. 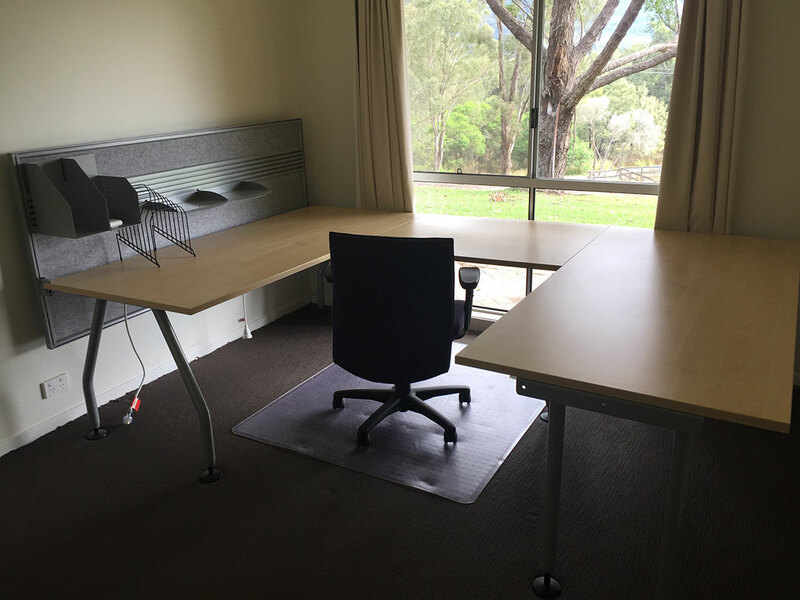 Meeting rooms for AGL staff May 2016. 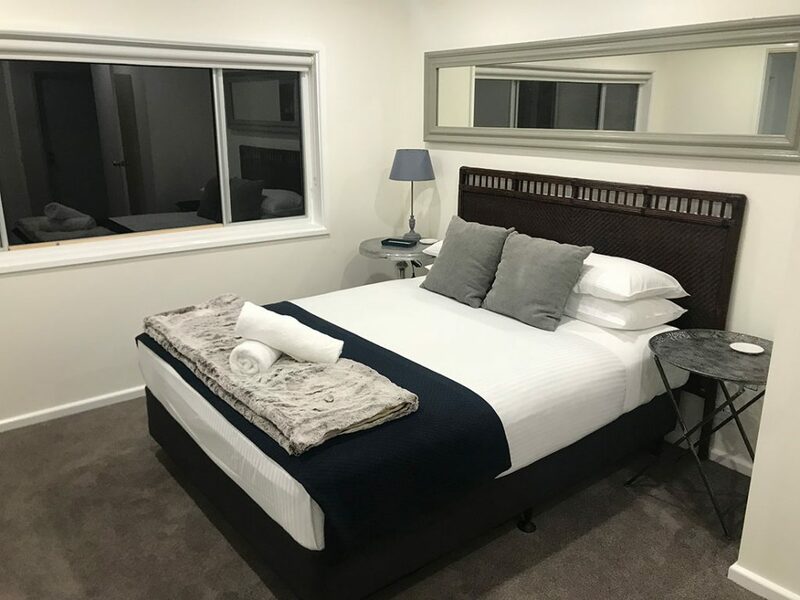 Newly added bedroom with ensuite bathroom and adjoining rumpus room. 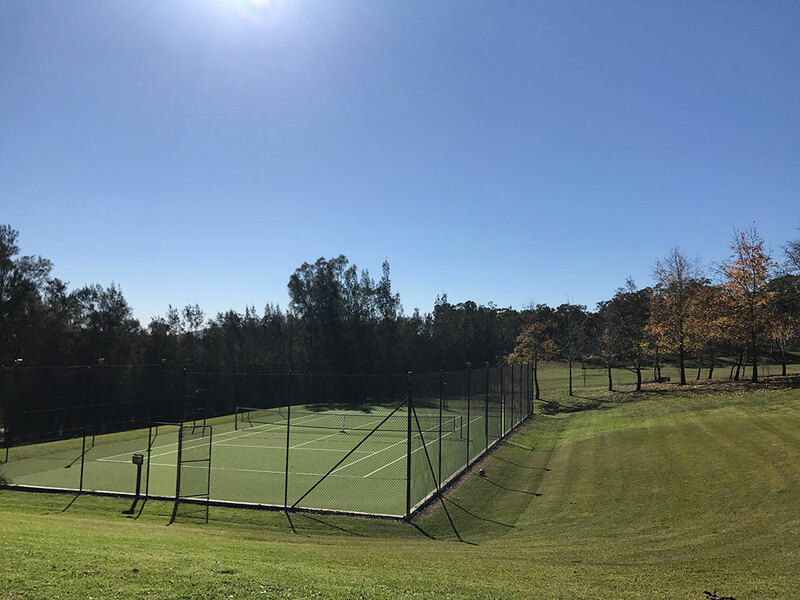 The tennis court next to the main residence was mostly in the shadow of spreading casuarinas. 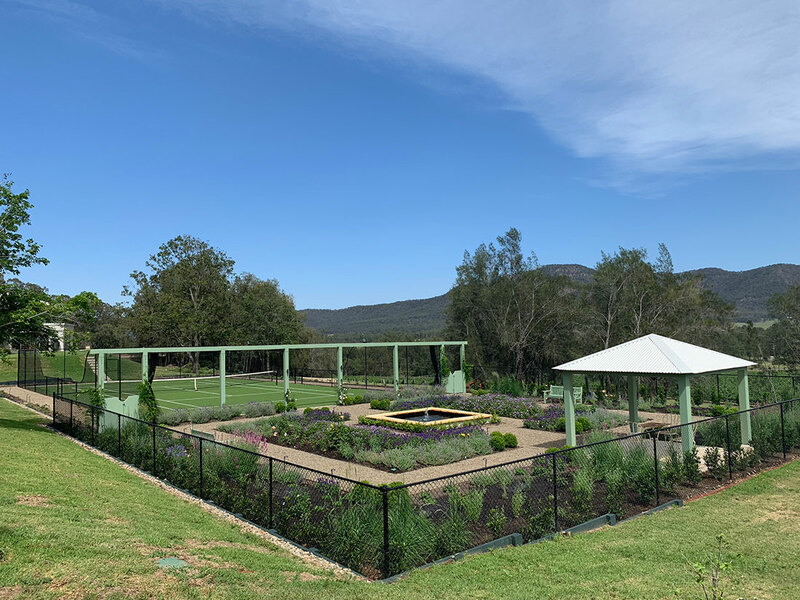 It was re-surfaced and re-fenced and internationally renowned Australian horticulturalist Paul Bangay OAM incorporated it into his stunning formal garden and gazebo area, which provides a showcase view from Winmark Private Residence. 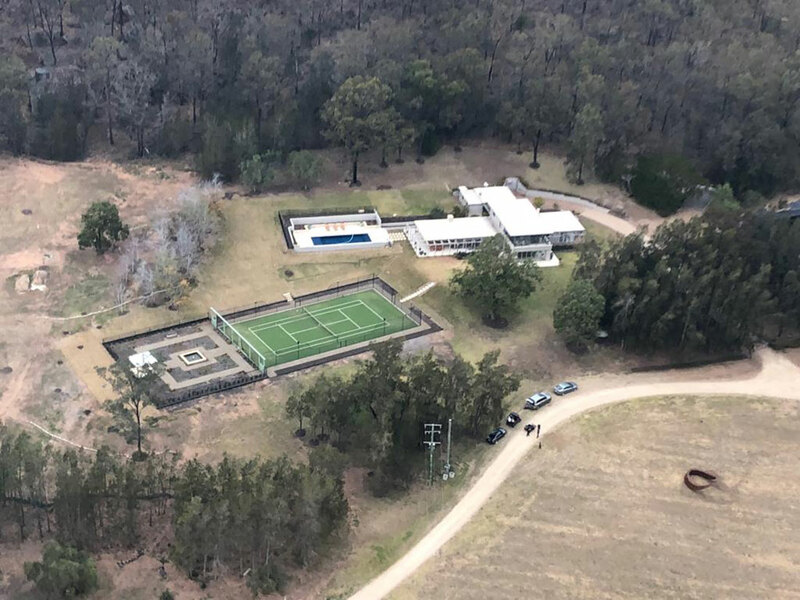 Aerial shot of Winmark private residence with surrounding landscape. Old Tennis court with tired broken fencing. 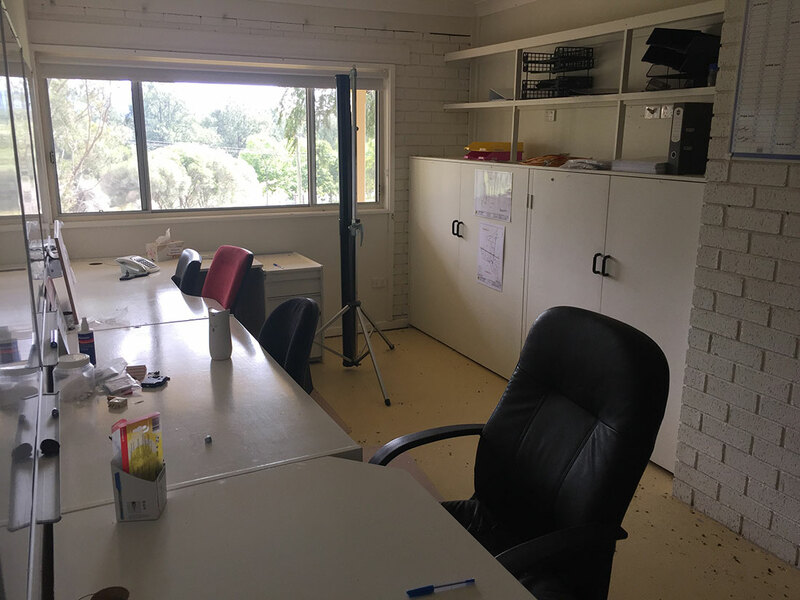 Back corner had moulded surfaces from tree shadows May 2016. 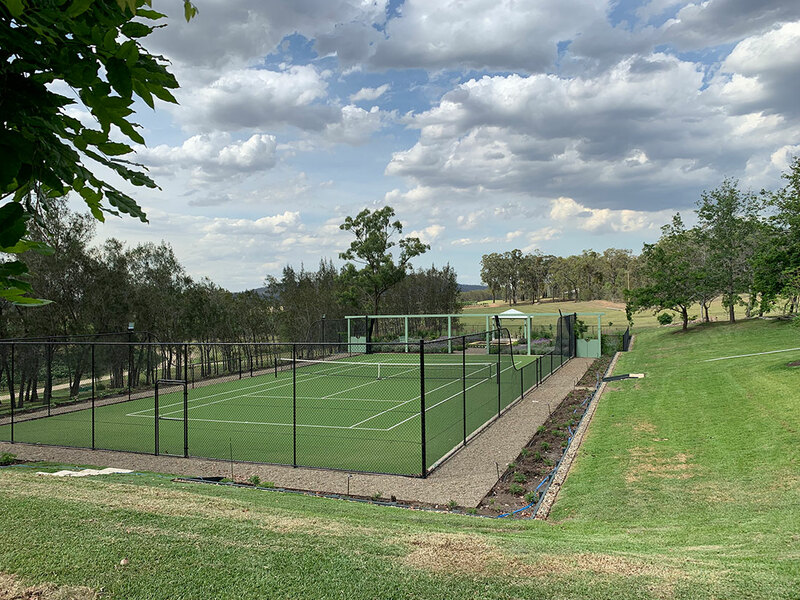 Resurfaced, newly fenced and floodlit championship tennis court incorporated seamlessly into stunning perennial and rose garden. Co-owner Karin Adcock, who has fostered a lifelong love of trees, has given her name to this array of 40 beautiful deciduous trees planted in a neat system close to Winmark Private Residence. 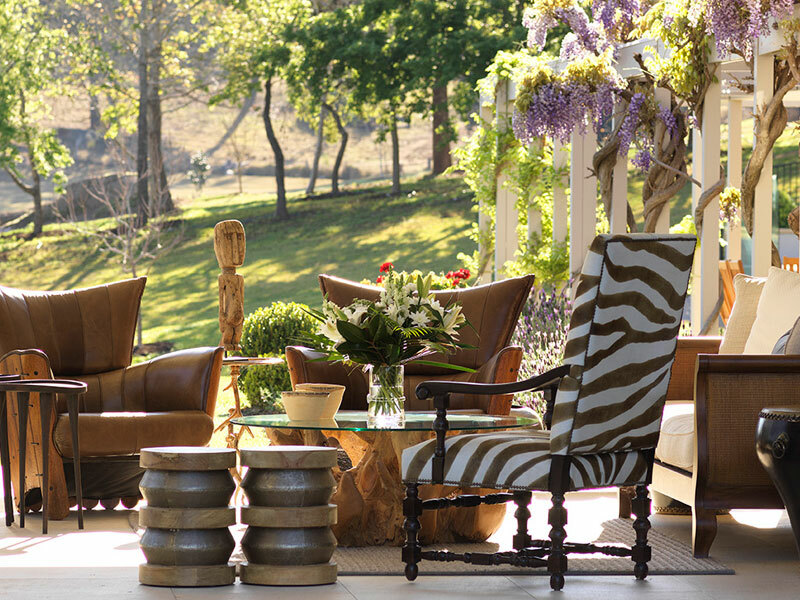 Karin’s intention in creating this haven was to enable guests to truly experience and appreciate the different seasons of these stunning trees. Another 2 blocks with dead vines which needed to be pulled out May 2016. The 2 blocks are cleared and named the 'Dream Blocks' as we have many dreams for these locations Nov 2018. Newly planted deciduous Nov 2018. The block has been cleared and ready for planting of the Koppie Jul 2016. A block of vines which had all died. This block was pulled out making way for Karin's Koppie May 2016. 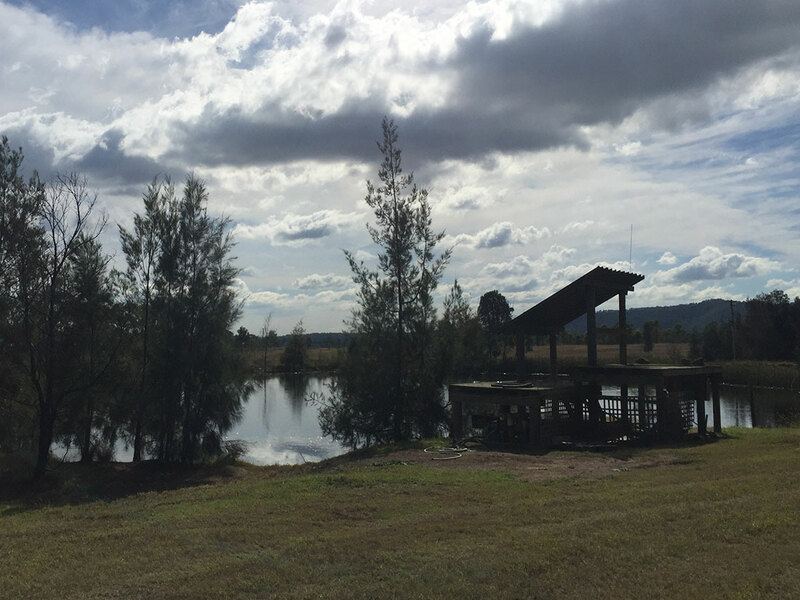 The property has three dams. 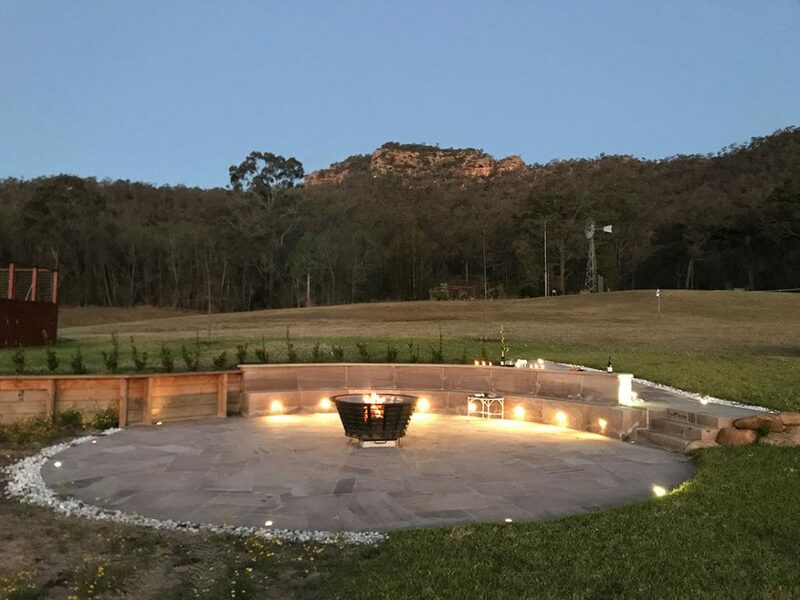 The owners have created a stunning African-themed fire pit entertaining area on the banks of the main dam so guests can enjoy the spectacular sunsets in style. Old pump house at main dam May 2016. New pump house Nov 2018. 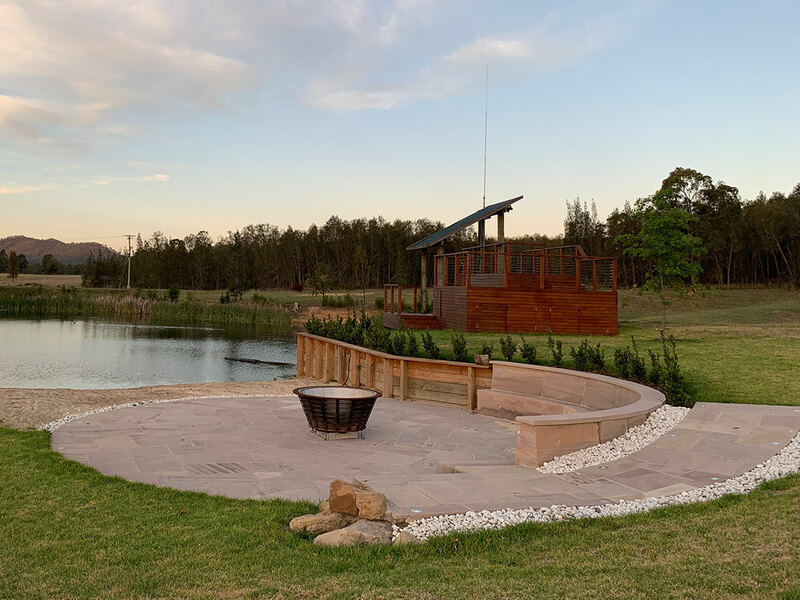 Sandstone fire pit and picnic bbq area at main dam with the new pump house Nov 2018. 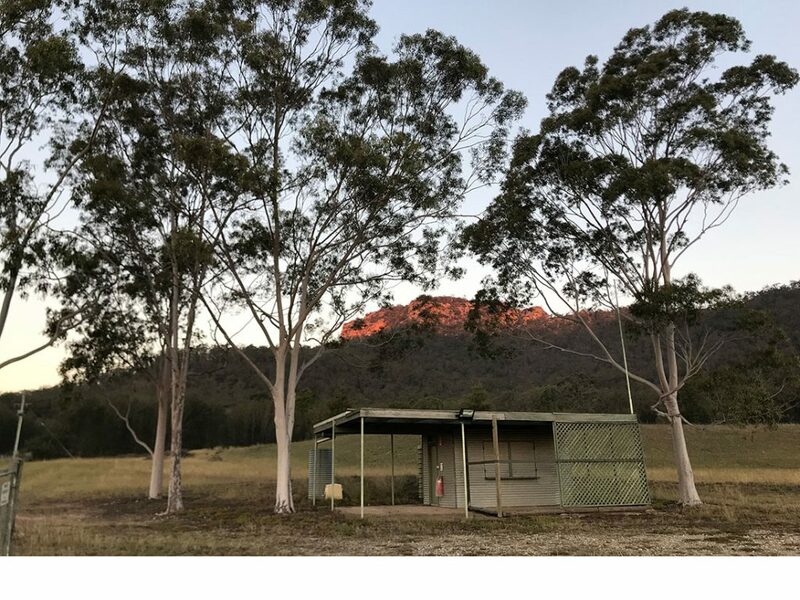 Very cosy setting at sunset with Yellow Rock as a backdrop May 2018. 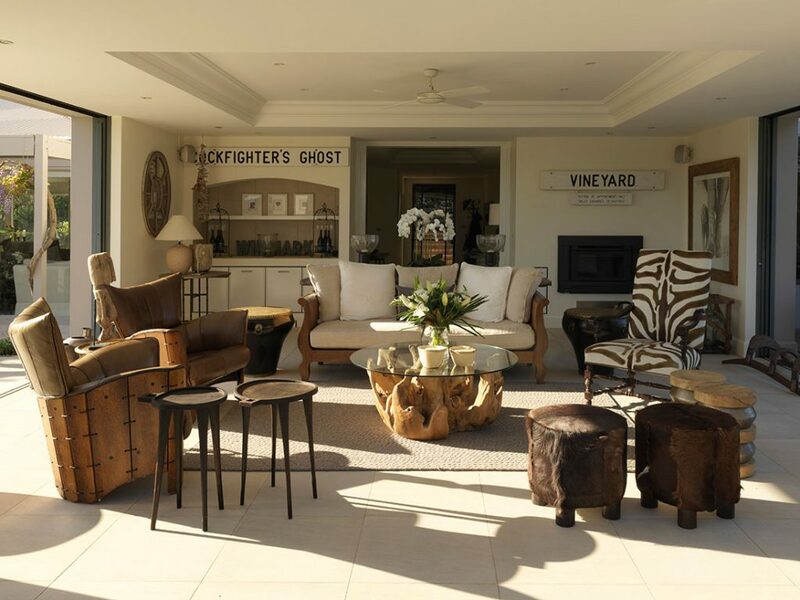 The original humble cellar door has been re-designed by renowned Danish architect Fong Chan Zeuthen, Karin’s Adcock’s sister. 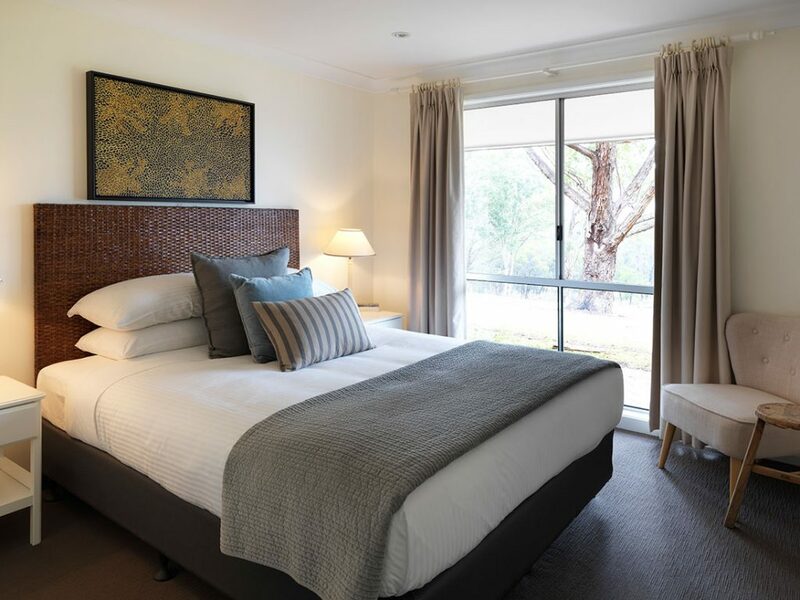 Its earthy, stylish, yet unpretentious character honours the history of the property and the beauty of the landscape. It is set to open around 2021 and become another Winmark landmark. 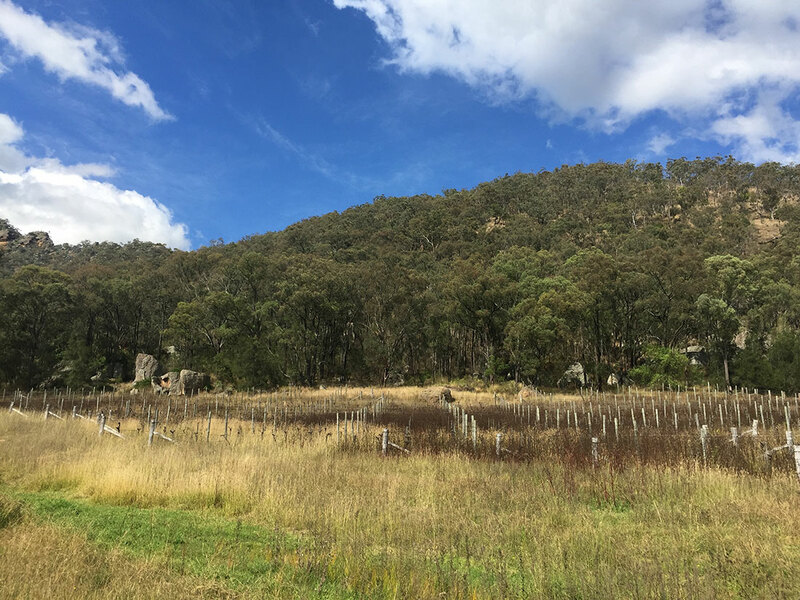 The old cellar door which operated in 80’s and 90’s with Yellow Rock illuminating the sunset and surrounds. 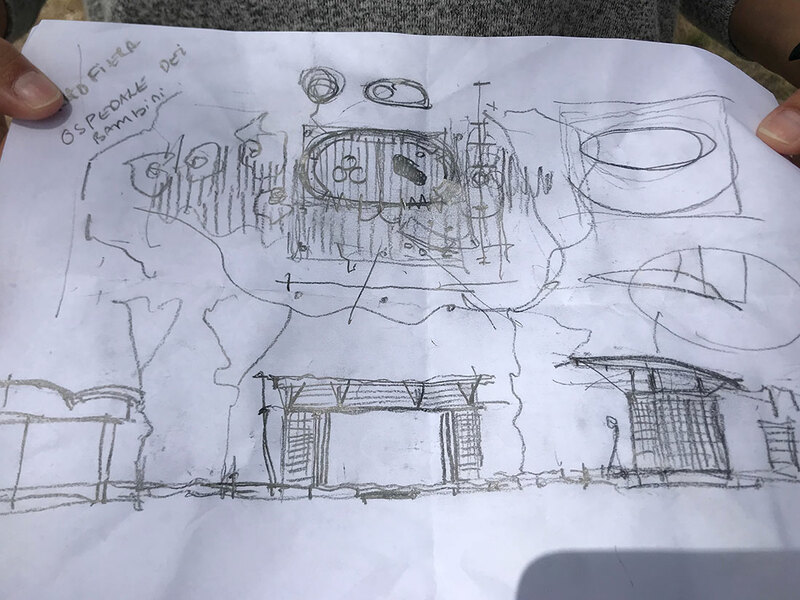 February 2018 Architect Fong Chan Zeuthen, Kaze Vietnam conceptualize the design of the new Cellar door. Fong Chan Zeuthen’s artist impression sympathetically blending the old in a new vision for the cellar door. 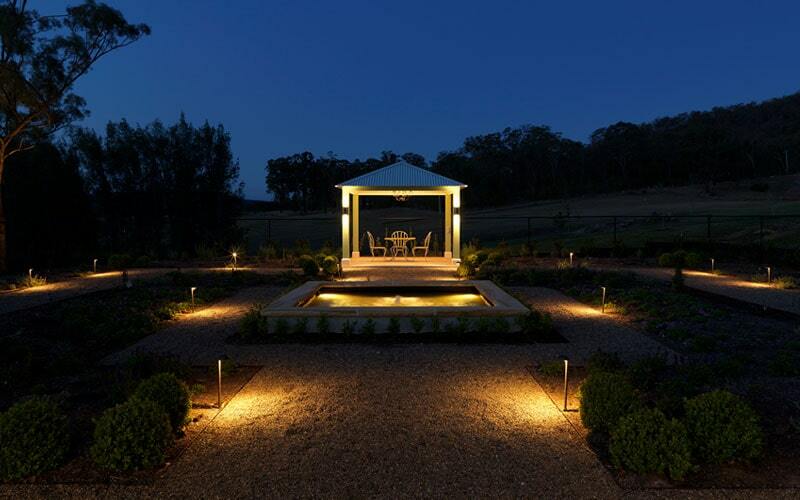 The Winmark Wines estate takes its personality from multi-award-winning businesswoman Karin Adcock. 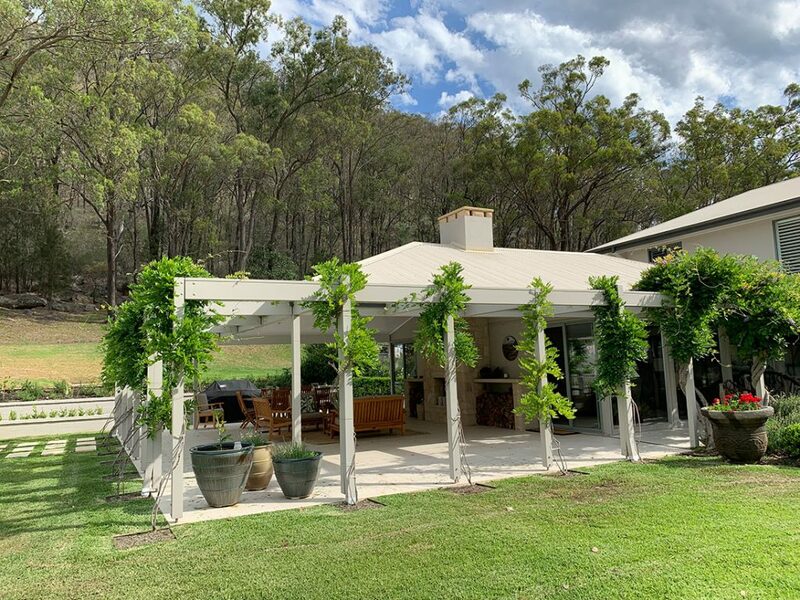 Karin has poured other lifelong loves, ranging from a passion for interiors to expertise in revitalising large properties, into the estate. Karin is renowned for bringing PANDORA jewellery from her native Denmark to Australia. She started the business in her Northern Beaches garage and transformed it into the world’s most successful PANDORA entity. She achieved double per capita sales of the second most successful PANDORA country, Britain, and five times the sales of Denmark before selling it back to PANDORA. 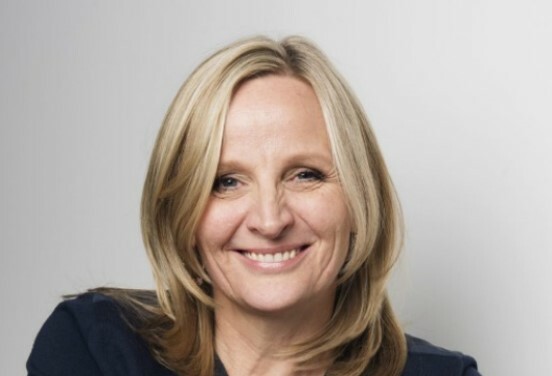 Karin’s skill in “being the glue” that binds her talented team together helped her win the NSW Telstra Businesswoman of the Year award in 2010. 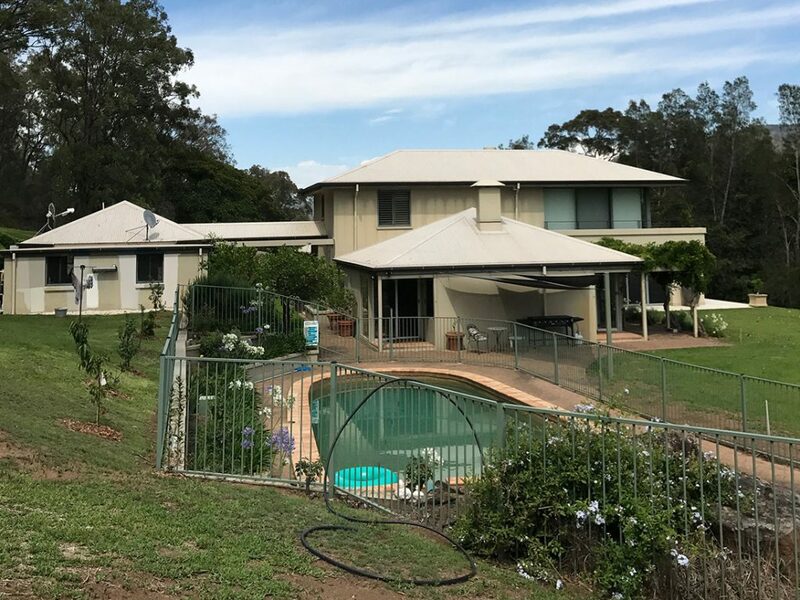 Karin spent a decade in her youth as a project manager, revitalising scores of large properties in Denmark and offshore, ranging from educational facilities to what was the world’s largest mango farm at the time. 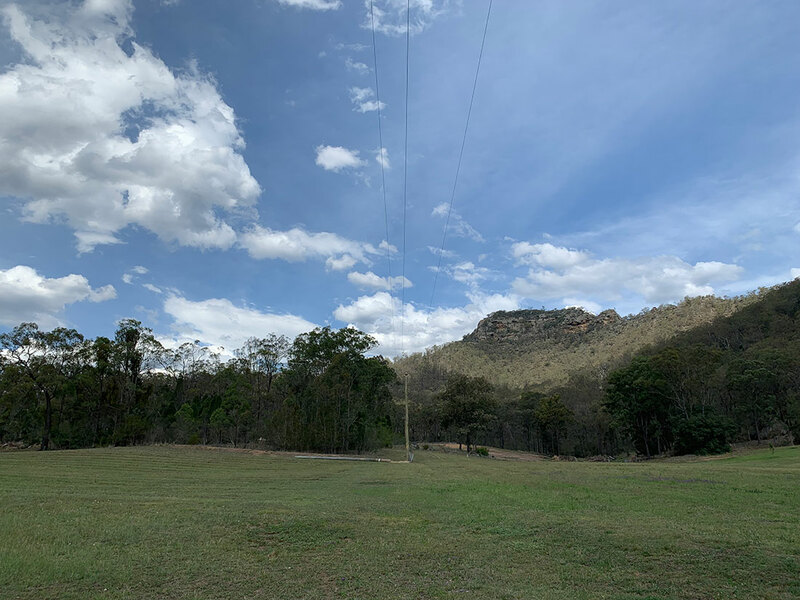 She and partner John purchased the former Pooles Rock property, which had been neglected for five years, in 2016 to create a special place for family to gather and connect. The pair quickly applied their extensive collective experiences and talents to the project. 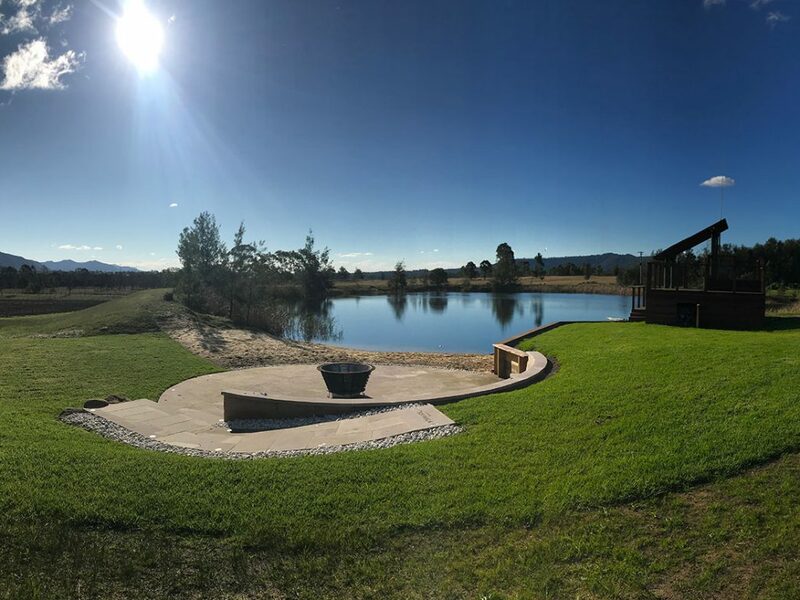 “We are dedicated to restoring Winmark, to creating a unique and beautiful place to explore, experience and unwind,” Karin said. “We are passionate about its history and feel a responsibility to provide an authentic restoration for future generations to share. John considers the restoration and reinvigoration of Winmark as a lifetime highlight. John invested in his first vineyard in South Africa in his early 20s and has pursued a global passion for wine ever since. 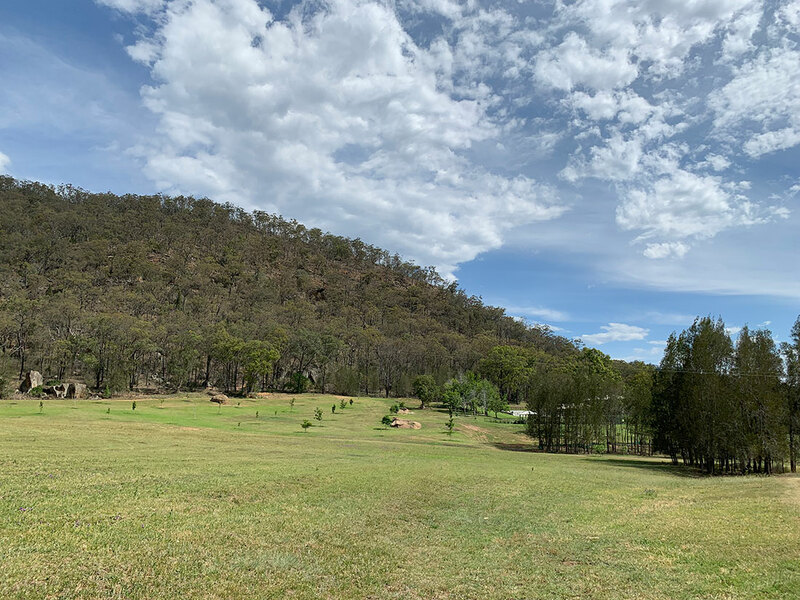 He moved to Australia in 1995 to become CEO of Rugby NSW where he worked with prominent wine figures, such as the late David Clarke, the Macquarie Bank founder and original owner of Pooles Rock. 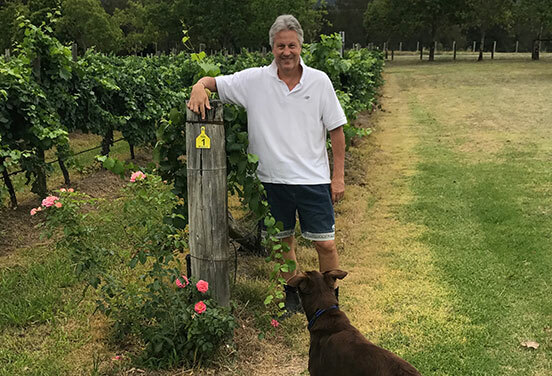 John’s tenure as CEO of the Wine Society from 2005 to 2008 expanded his commercial understanding of the Australian wine landscape and fuelled his passion. 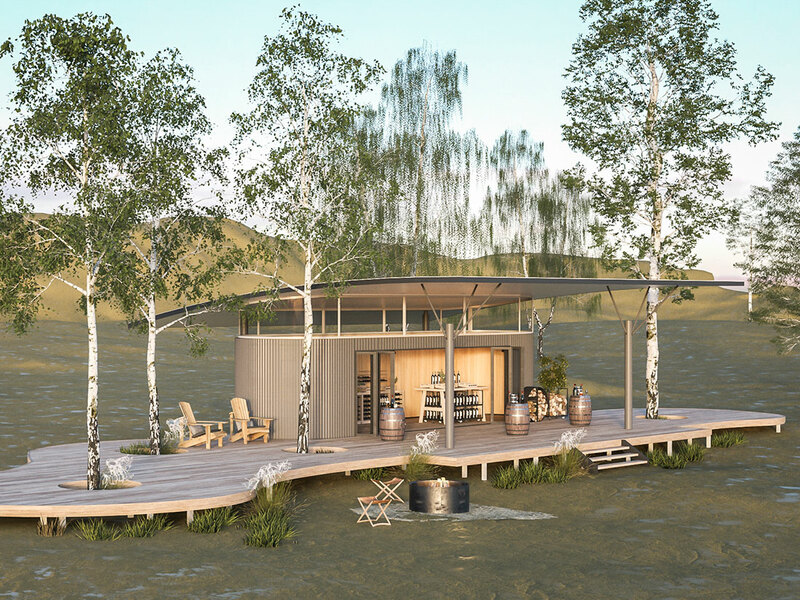 “The concept of what you have in your glass and everything that goes before that is a perfect blend of nature, commercialism, creativity and a result that stirs your senses,” says John. John has 35 years of experience in board positions with national and global brands. 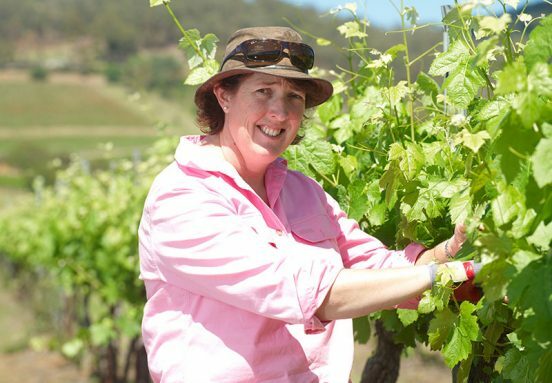 Liz Riley, Viticulturist of the Year 2017, has a prestigious list of credentials that began as a teenager and spans global territory. 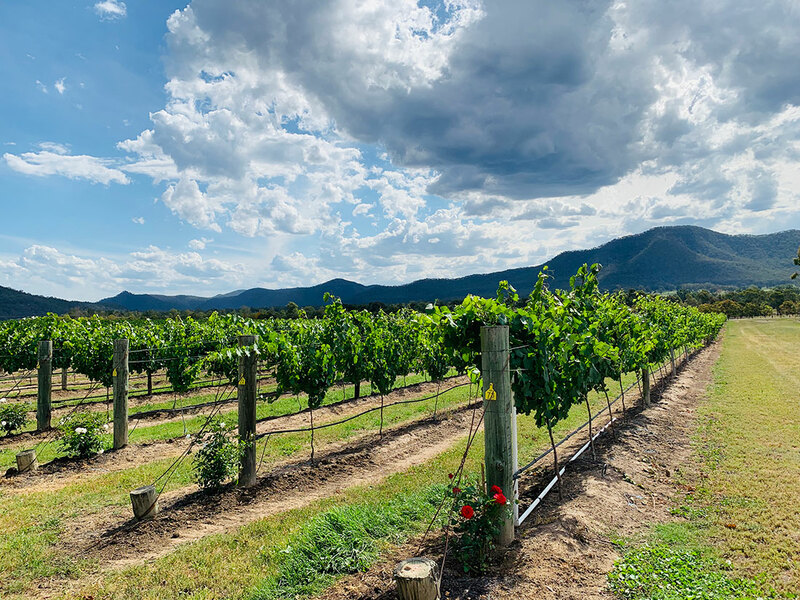 Liz won the coveted Australian Nuffield Scholarship after completing a Bachelor of Wine Science and travelled to Europe and North America to focus on global agriculture and sustainable viticulture. She has also worked on vintages in the Naper Valley, California. 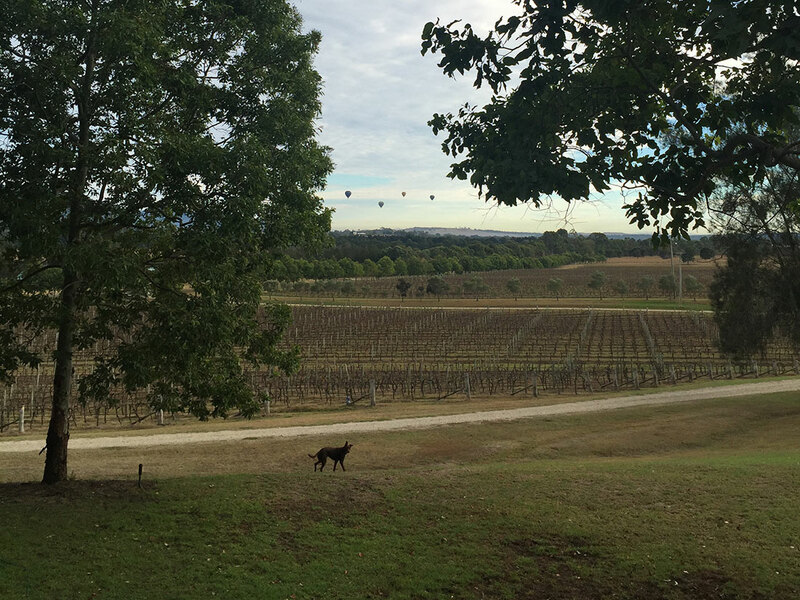 Liz and her local winemaker husband have lived and worked in the Hunter Valley since 1996. 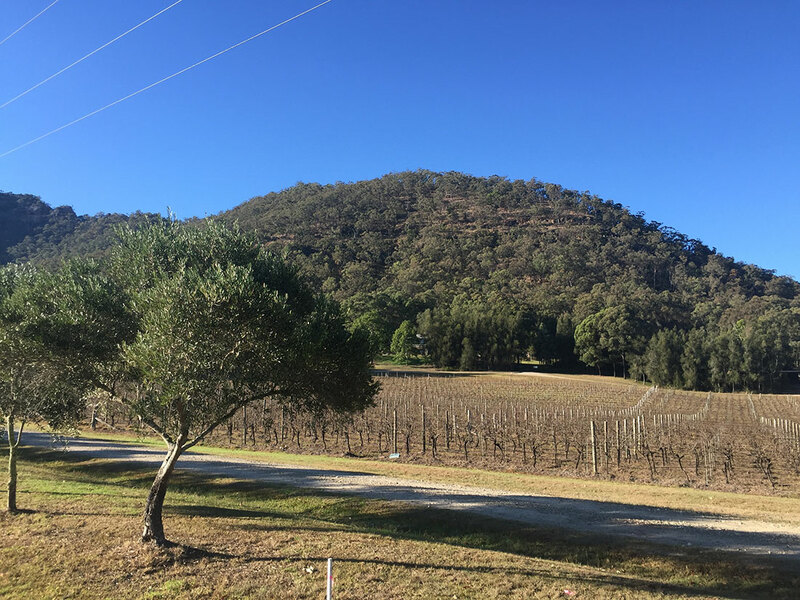 Liz and Vineyard Manager Dave Grosser have been entrusted to reinvigorate this iconic vineyard because of their reputations, passionate attention to detail and experience. 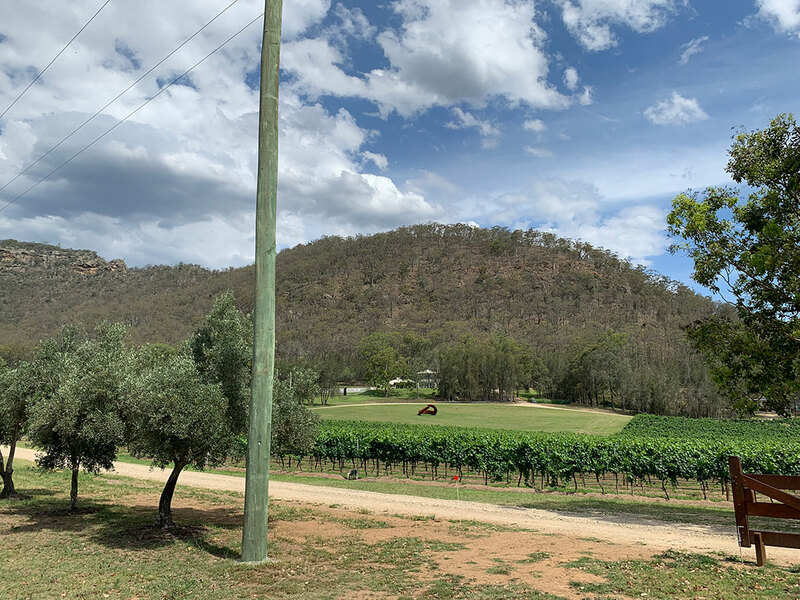 Dave was born into a viticultural family in Broke to parents who worked collectively for three decades on the Winmark property when it was known as Pooles Rock. 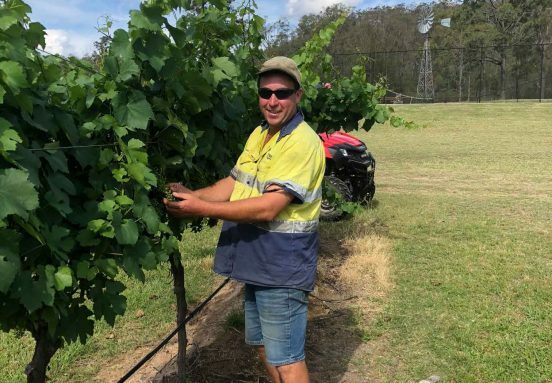 Dave completed a Diploma of Viticulture in 1999 and worked with his father in vineyard development to learn about all facets of viticulture. He started his own consultancy in 2006. Dave’s experience, best practice methods and attention to detail have earned him admiration from within the industry. 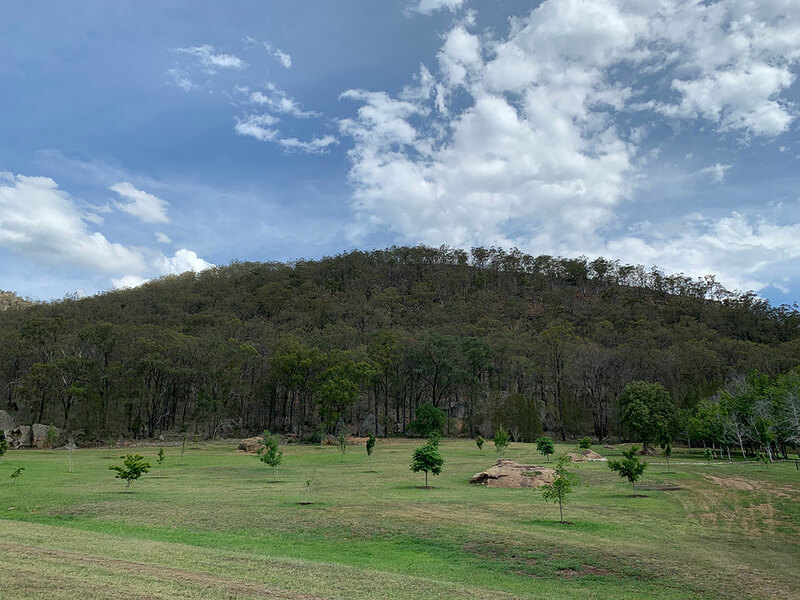 The iconic rock, Pooles Rock, is named after destitute former convict Richard Poole who slept in a hollow inside the rock. The first 18 rows of block 4 are planted. They are said to be some of the oldest chardonnay vines in the Broke Fordwich district and are the famous Penfold’s clone. 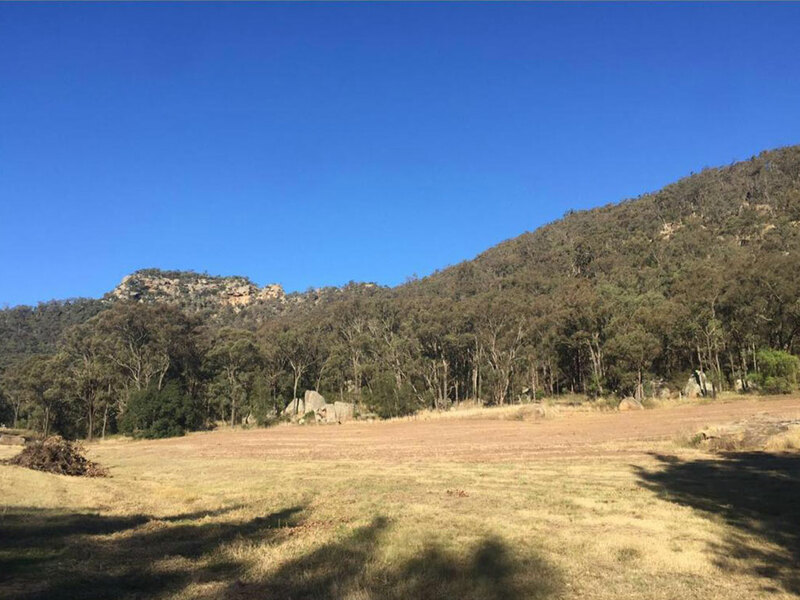 Macquarie Bank founder Davide Clarke buys Pooles Rock and block 5 is planted. David Clarke plants Blocks 1 and 2 on Pooles Rock. The original semillion is replaced by chardonnay in Row 19 to 38. 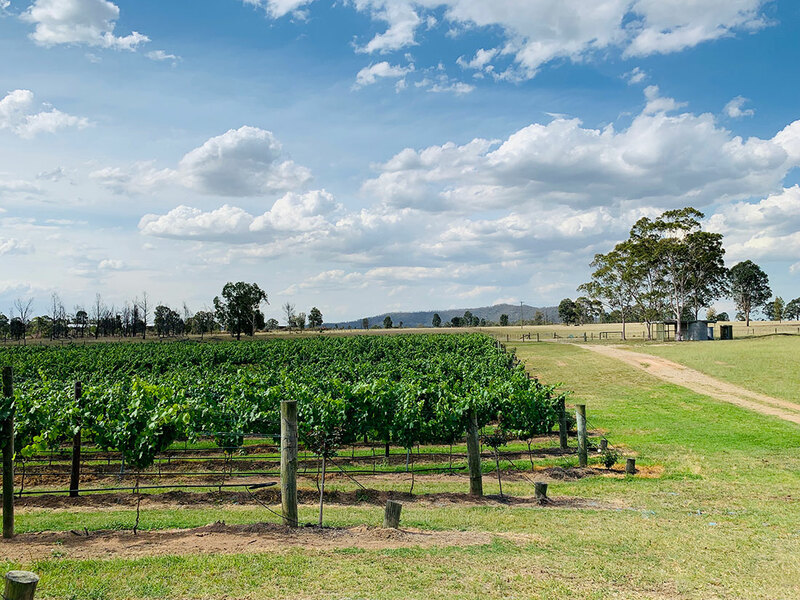 Pooles Rock wines are awarded more than 80 medals by the Hunter Valley Wines Show and the Australia National Vine show and several wines score 96 points by James Halliday. 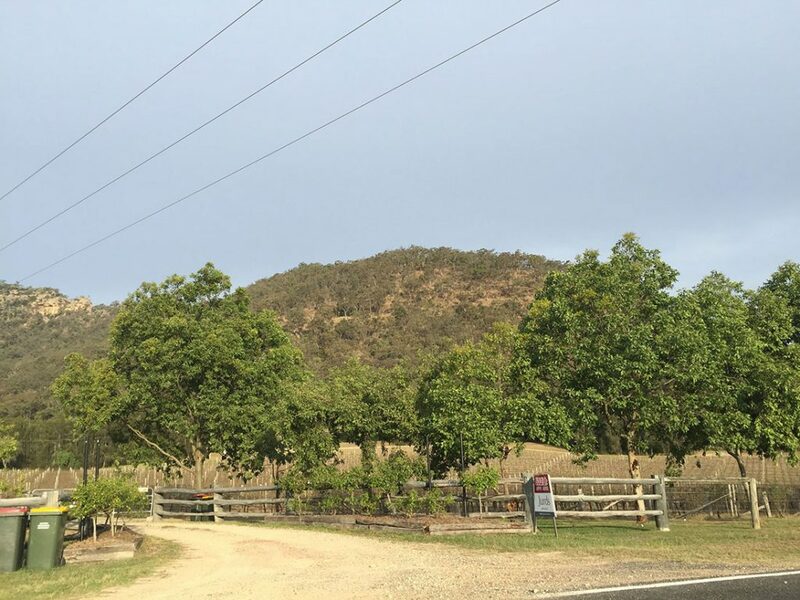 John Winstanley and Karin Adcock purchase the Pooles Rock property and establish Winmark Wines. 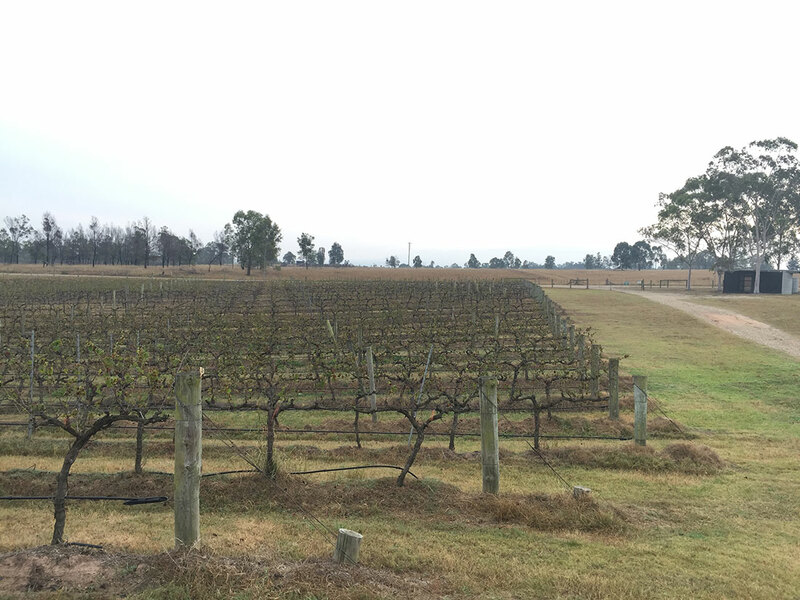 The vineyard enters a renewal phase with verdelho (block 5) removed ahead of redevelopment. Award-winning Liz Riley is appointed Viticulturist and David Grosser of Vitigro becomes Vineyard Manager. The block is cleared and replanted with premium chardonnay clones ENTAV 548 and 95 Bernard. Winmark Wines 2018 Chardonnay is bottled ready for release in late 2018. 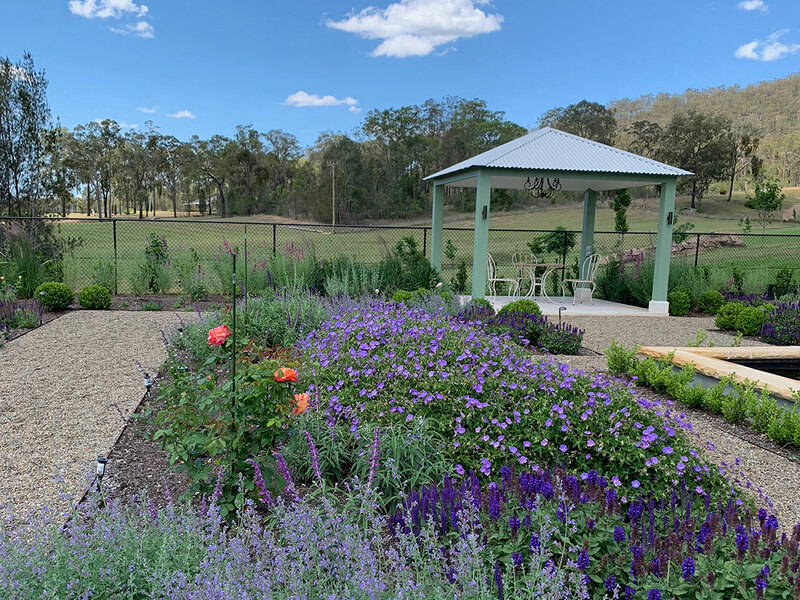 The grounds are transformed by a perennial and rose garden designed by Paul Bangay. David Ball’s sculpture Biosis is installed alongside a tree park known as Karin’s Koppie.